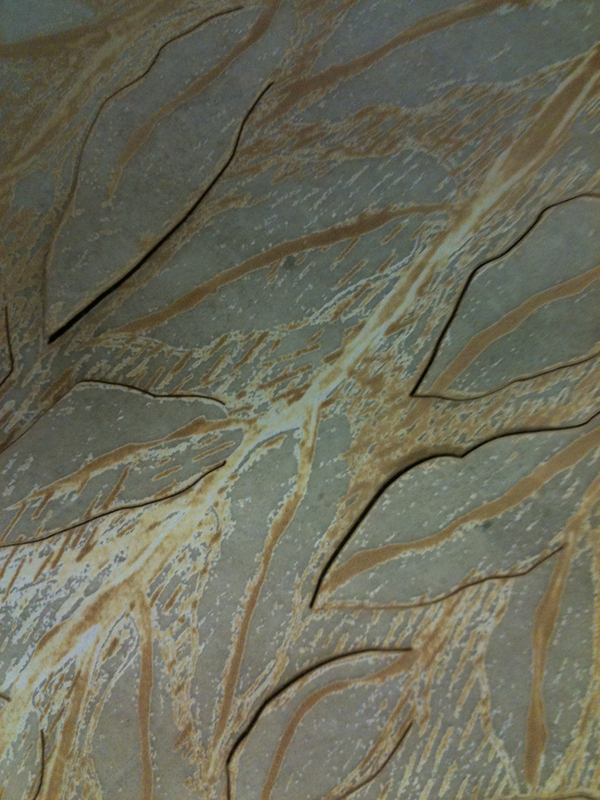 I have become fascinated by skin as a material to work with. This has come about, no doubt, by my recent project to develop a piece of work for Pairings II for the Stroud International Textile exhibition. 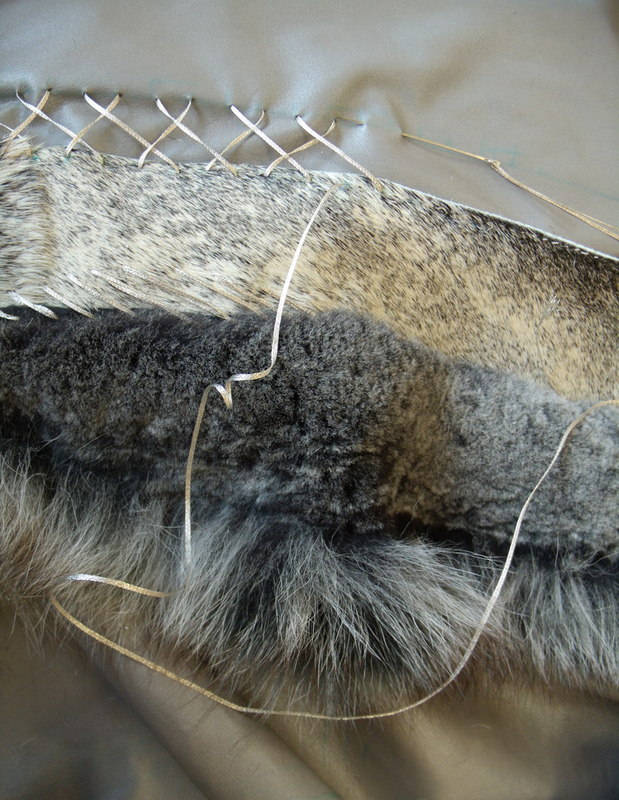 I used a huge skin that had been prepared as vellum – or parchment – a hide, possibly reindeer in this case, treated in such a way as to make a smooth, hard, fine grained surface after removing the pelt, either fur or hair – don’t let’s forget that all animal leather and suede is simply skin with the fur or hair shaved off. 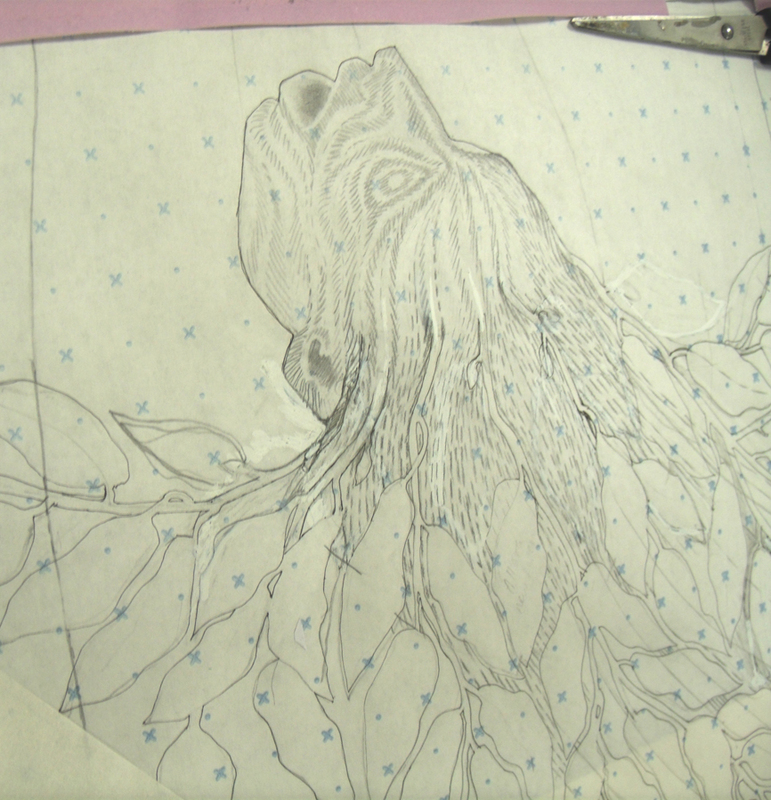 What is really exciting me about working with vellum is that I can draw onto it as well as stitch into it. 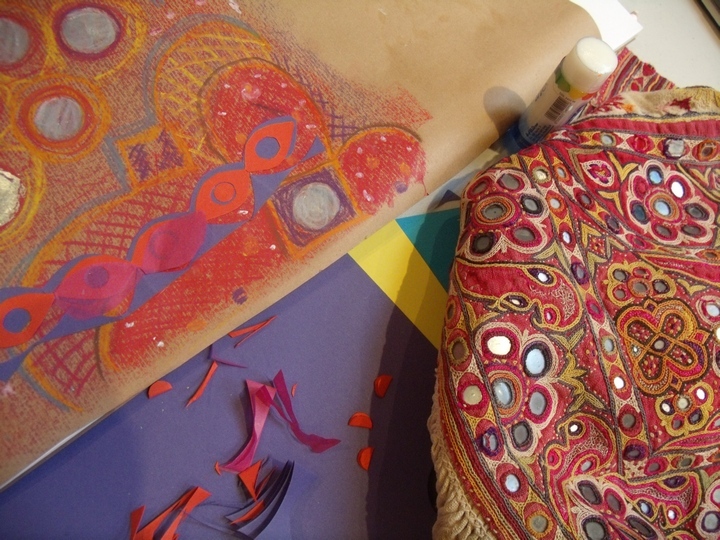 There are other things to do with it as well but drawing and stitching really are the backbone of my textile practice, and here is a new material redolent with all sorts of symbolism that I can start to mine. 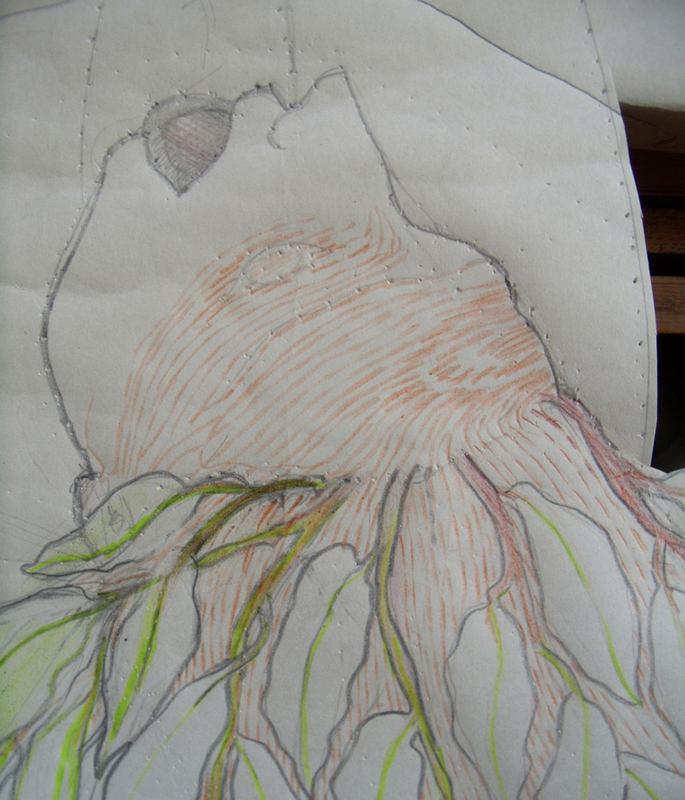 So maybe this will lead to more drawn imagery with stitch to enhance the drawing – not sure yet – but hand stitching this material needs long and slow preparation. 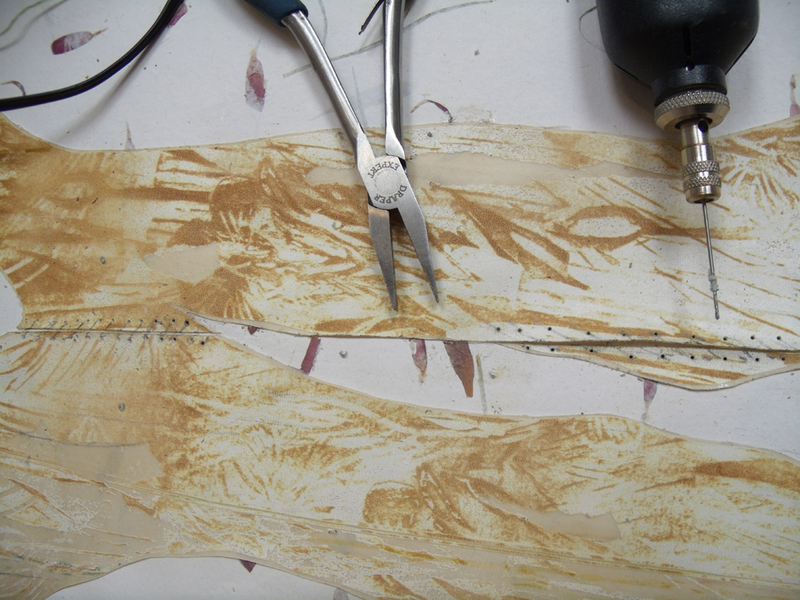 I have done quite a lot of work with fine leather and suede, most recently at a workshop in Finland at the University of Ostrobothnia, at the faculty of Applied Sciences, where I first experienced the large scale sheets of vellum as an option to work with. 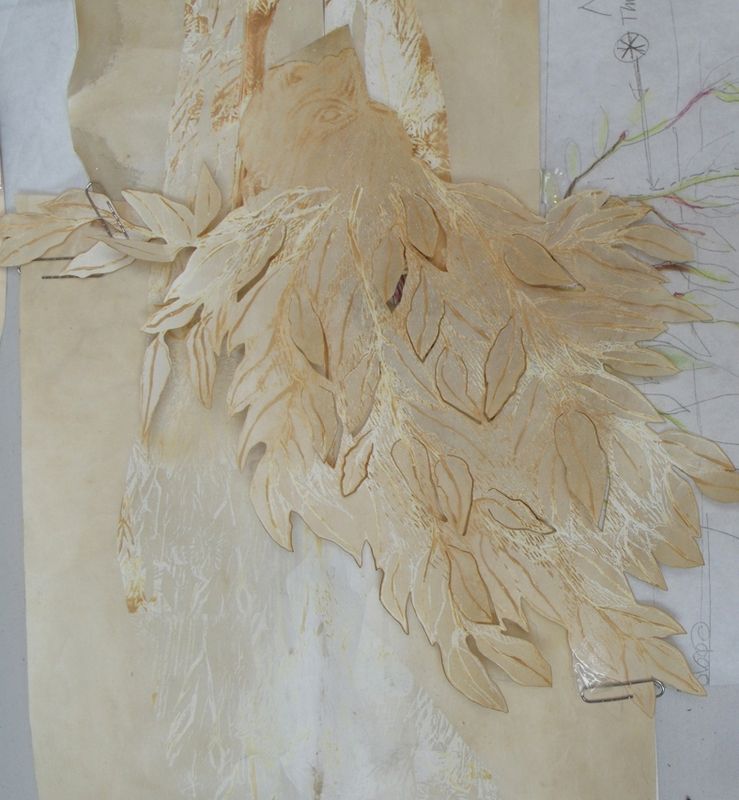 However I chose metallic leathers, cow hides and farmed fur to create an embroidered seascape, embellished with silver leaf. 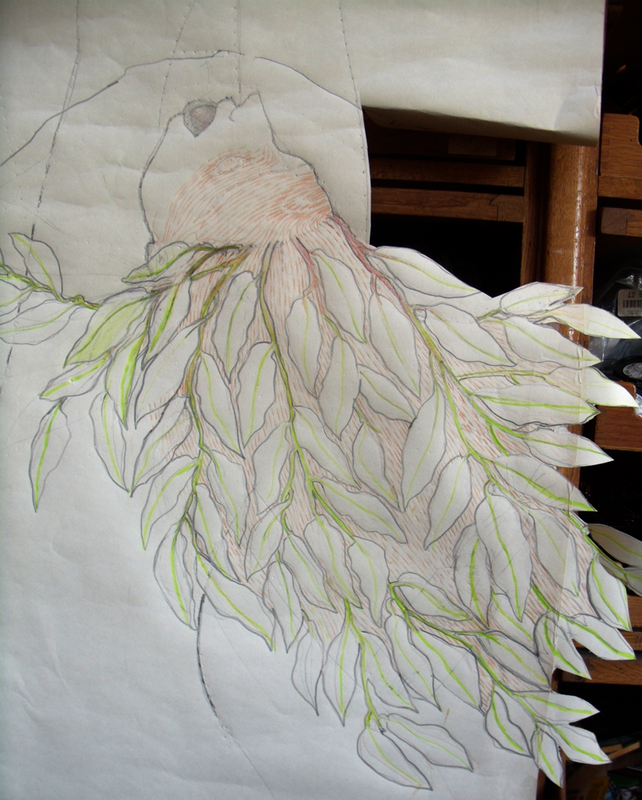 But I had remembered the large vellum skin and how beautiful it was and so used it for the Daphne Tree metamorphosis piece. 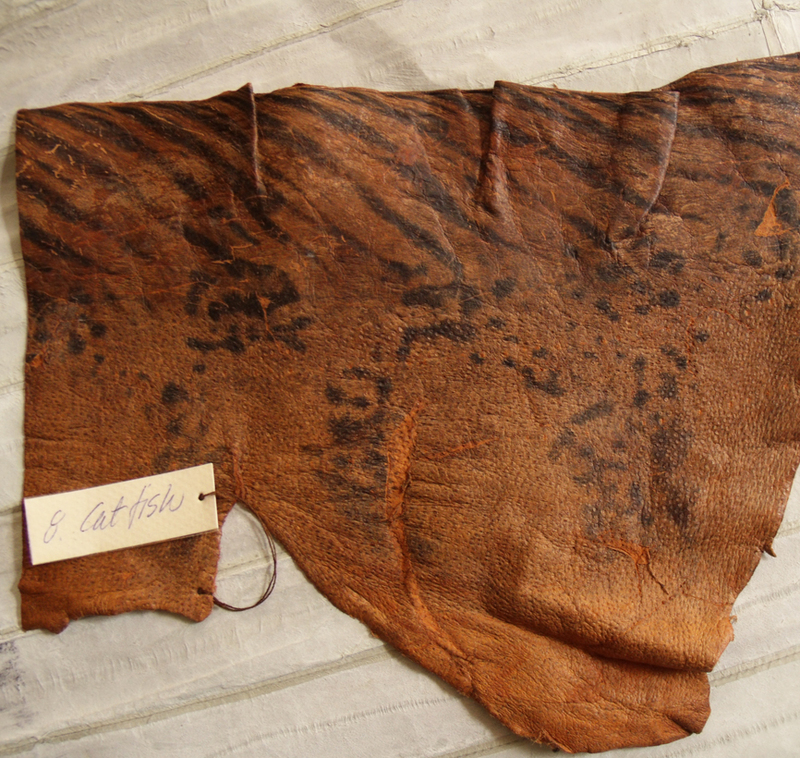 The company who farmed and manufactured the vellum, were generous in sending me a whole skin to work with; it has caused much interest in the exhibition, most people seem to think that vellum is just some esoteric writing-paper and keep asking me where is the animal? 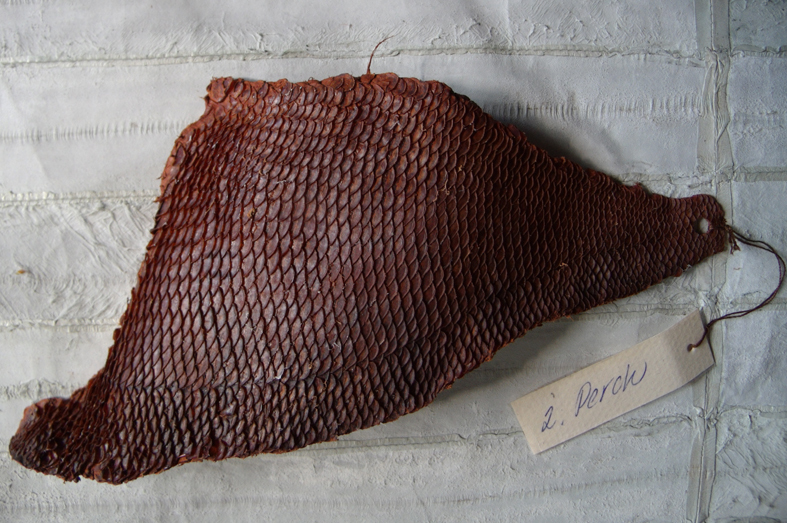 But what is really exciting is that the leader of the Finnish workshop, Basil Kardasis, is conducting another workshop at Heart Space Studios, but this time using one of the most unusual and beautiful of skins – fish. 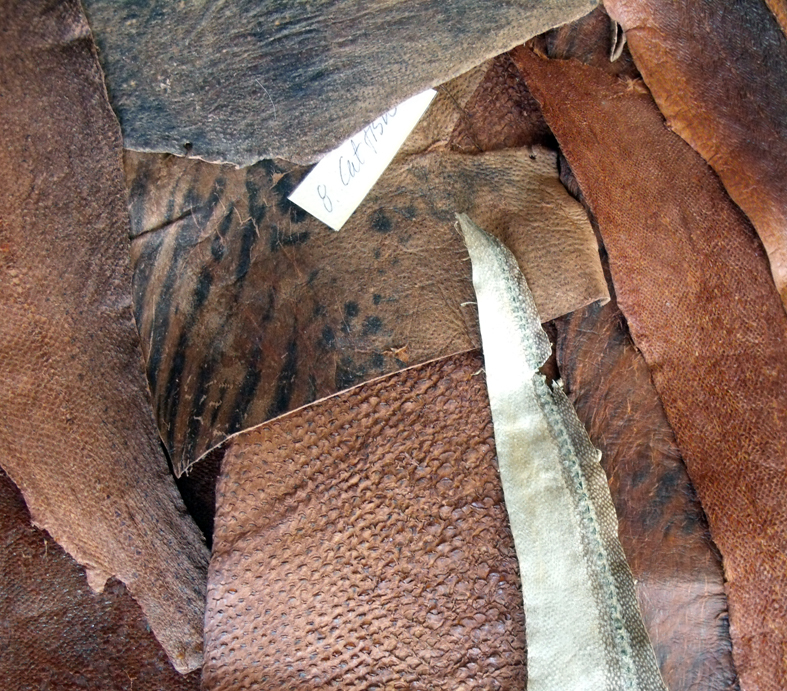 He is introducing this material for a master class for experienced makers, called Surf, Turf and Sky, using fish skins, leathers and feathers – all of which are by-products of the food industry, so think eel…. 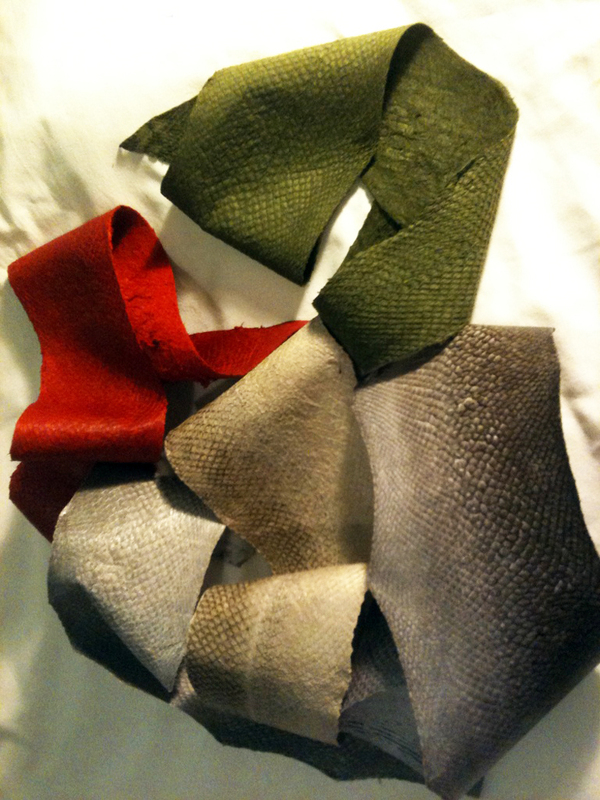 and smaller whole dyed fish skins….like salmon, trout, pike…. 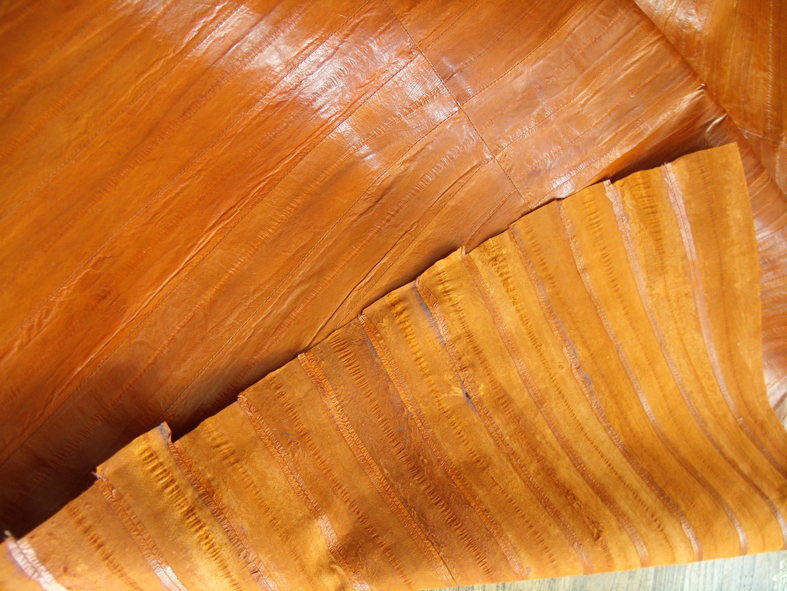 and also some specially hand – tanned skins from Sweden, perch, cat fish, and plaice. 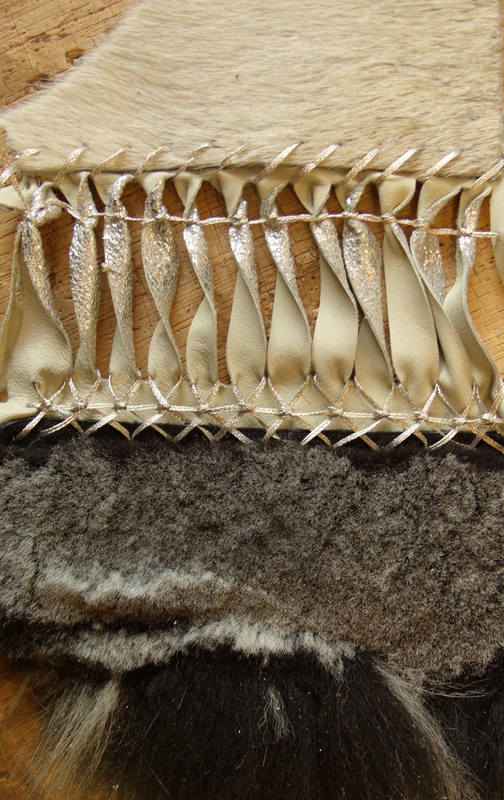 the individual skins are small but call out to be combined with other materials to enable us to make fabrics out of them..
but my favourite fish sample is a tiny single side of Knot, it already appears to be embroidered. 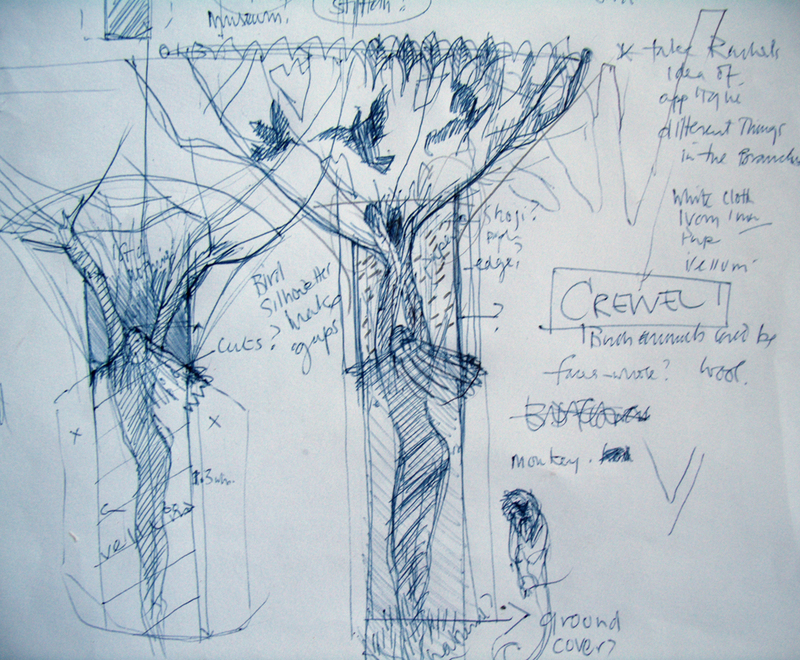 Categories: Drawing, Heart Space Studios, Pairings - Live Project | Permalink. 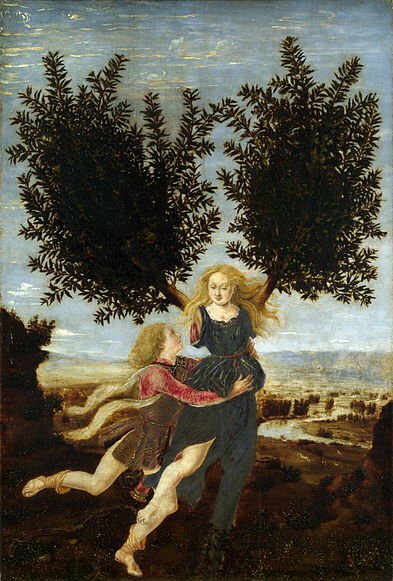 Plan B for the Daphne Tree. I have been too busy to blog – or rather too tired after working a succession of 12 hour days to get to the deadline, today, for putting this work on the wall of the Pairings exhibition. 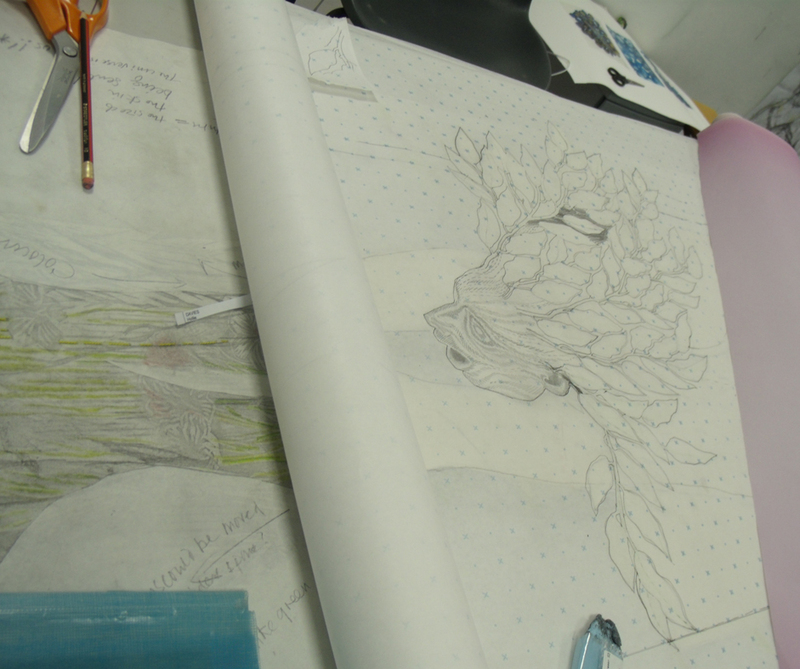 I have been making the Daphne Tree with Rachel Kelly, designer of Interactive Wallpaper, and Daphne is a truly metamorphic development. She morphs from a laser etched drawing in animal skin – (I suspect reindeer as this is a gift from the manufacturers in Finland,who produce and sell these large sheets of vellum or parchment for making into drum skins) through paper hand made petal infused and shoji screen papers which are vegetable eventually becoming cotton damask with a man made surface skin of printed decals…..But to start we have burnt a drawing of a figure using modern technology onto of the oldest drawing materials known to mankind – and the result is very very beautiful. The quality of the skin changes over the surface of the animal, thin and white on the sides nearest to the spine – which is dark; then translucent on the edges where it has been stretched and where, I presume, the skin is thinner. The results of the lasered marks are startlingly different, in places hardly discernible in others a beautiful burnt golden brown. 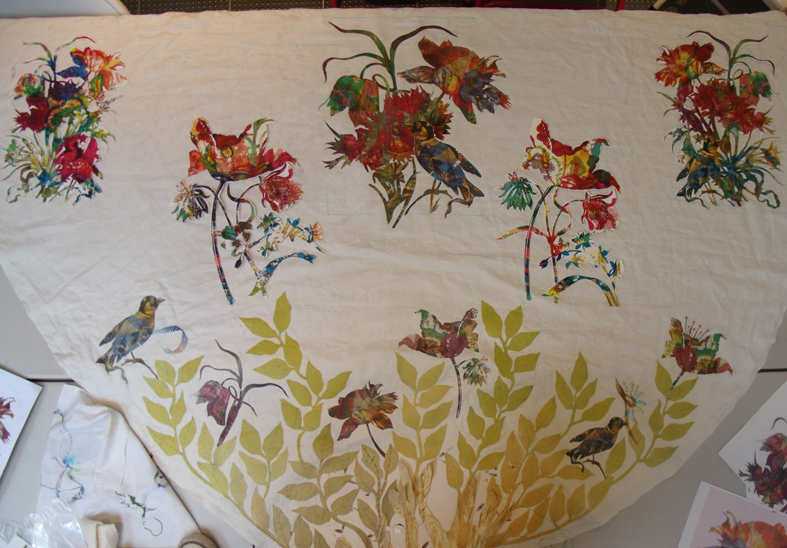 So far – so good, all going to plan…then we hit a series of snags, first the fabric chosen for printing the flowers of the canopy was not is stock and then Easter holidays meant that the staff in charge of the printing machine were away and suddenly everything looked to be very tight for getting it organised in time…. Plan B. I decided to ask Rachel to send me her designs on print transfer papers that can be ironed into position – I had seen this done before at Heart Space Studios by Teresa Searle and I knew it was a possibility to get things printed fast …so I bought some T shirt printing transfer papers from the local high street, and taking my courage on both hands started sampling. 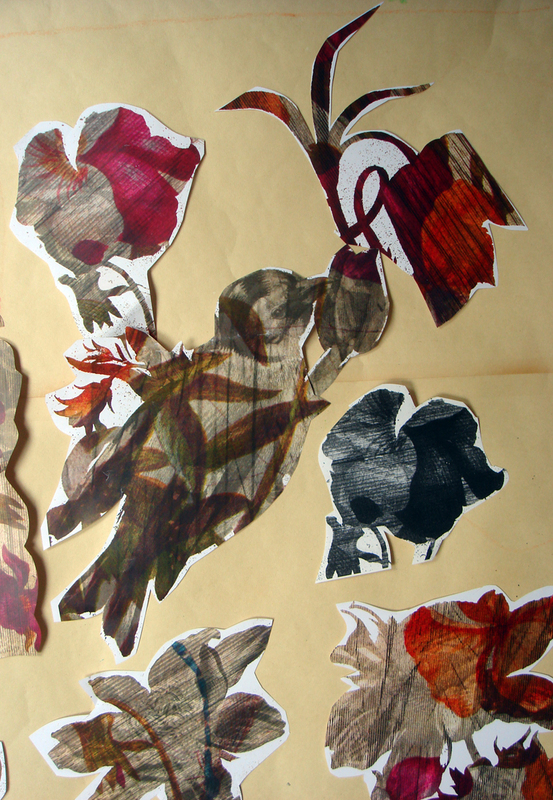 my sampled transfer bird with the new packages of prints from Rachel. 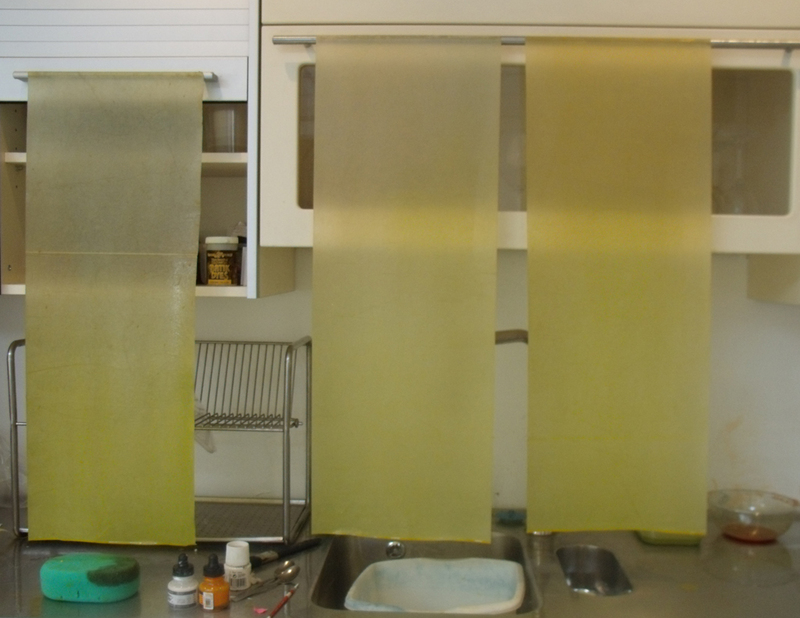 Meanwhile I stared to dye the shoji screen papers for the leaves which transitions the animal to the vegetable. 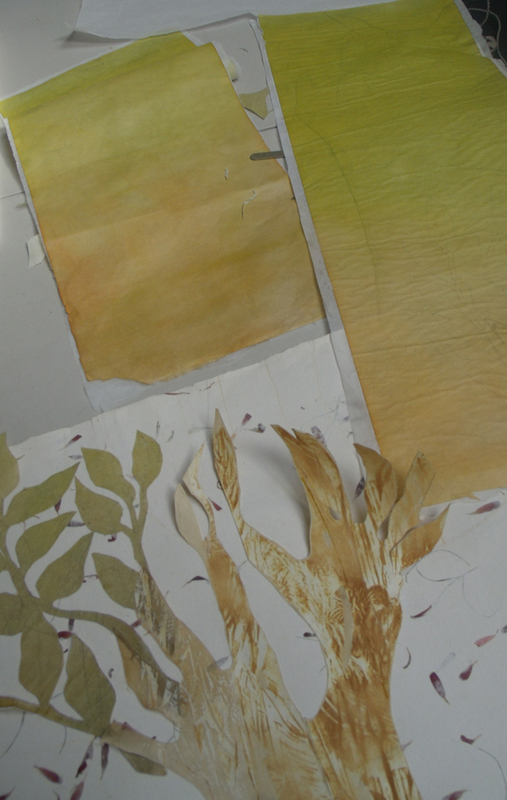 dyed papers cut and applied to petal paper for fingers to leaf transition. 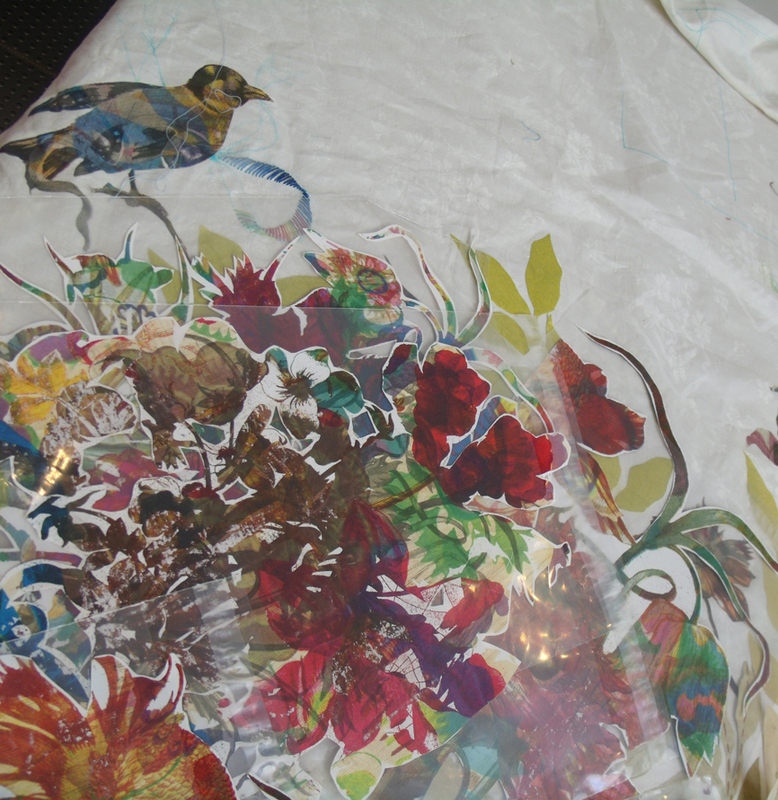 By this stage the transfer designs had arrived from Rachel – and they were really something else -brighter colours on new flowers…daffodils, tulips and big bouquets in brilliant colours – I loved them BUT they didn’t go with my first row of lovingly pressed transfers….I had to think on my feet – but hey I am a designer and this is what designers’ do…isn’t it? 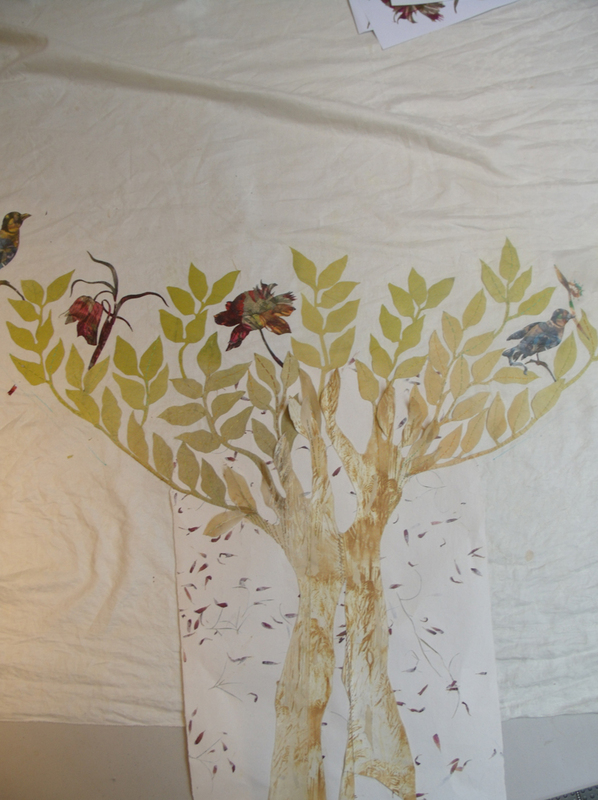 I definitely needed more leaves and many more flower transfers..the space looked massive that I had to fill up – about 1 x 1 1/2 metres wide….but eventually Rachel and I got there. OK I hear the more attentive of you say, ” you missed a bit – the body is now attached to the head which is attached to the arms…HOW did that happen”? Well it was all stitched together. me drilling the stitching holes to attach the head to the arms. 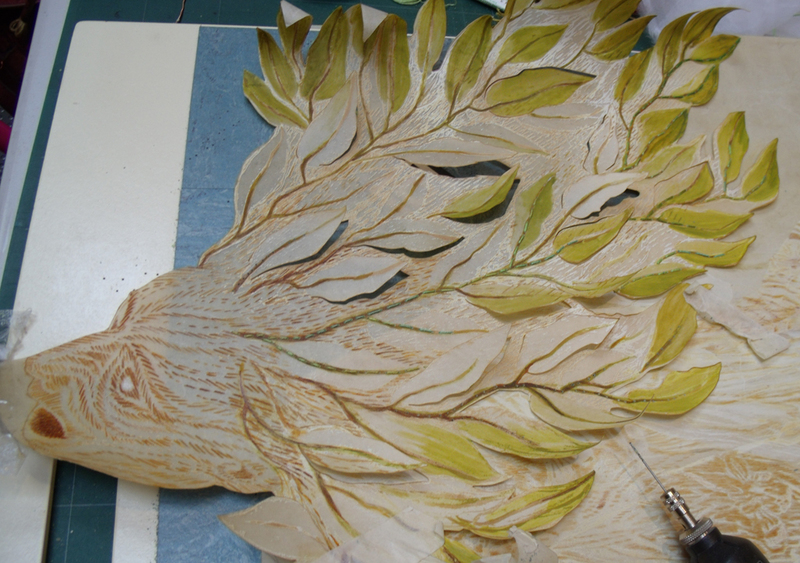 But eventually Rachel arrived yesterday to complete the flowery appliques..
All we have to do now is starch and press it, get it fixed to a cardboard tube as if it is a roll of fabric and take it to the exhibition…..you can get the latest update and the other side of the process by visiting our Pairings blog, which is by way of a conversation between us Rachel and myself. 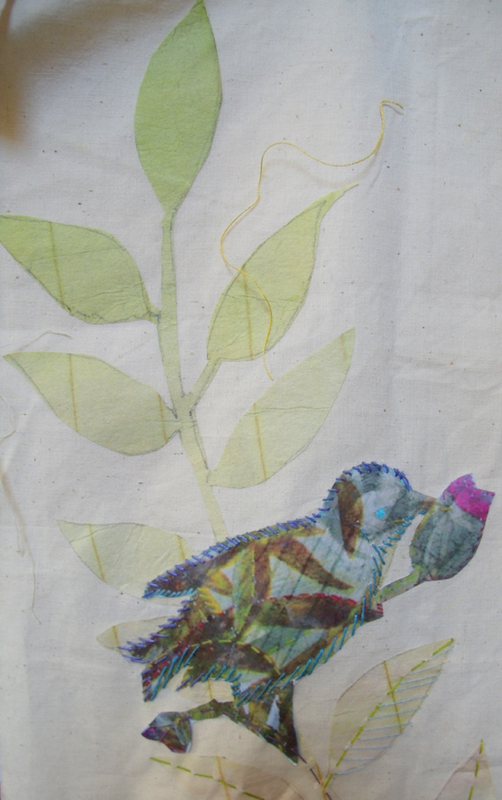 Yet another first for me – I have been invited to make a piece of work for an exhibition in the Select programme for Stroud International Textiles . 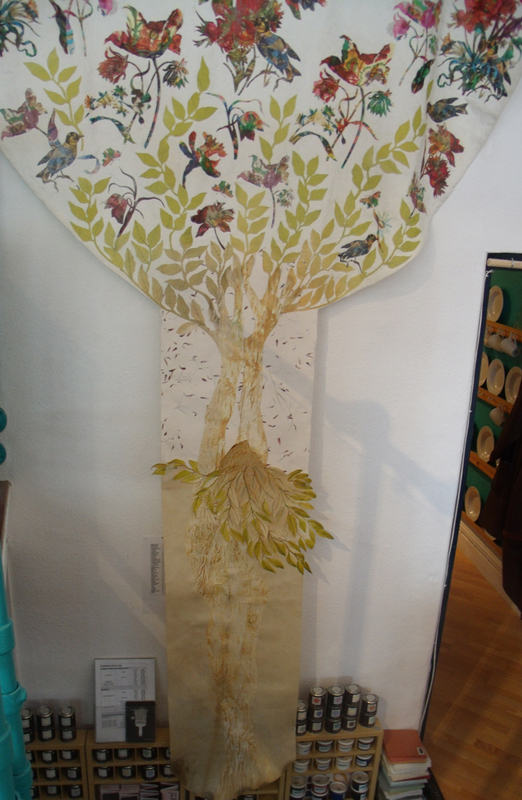 I have often visited the Stroud textile festivals and even posted my observations last year and the year before. 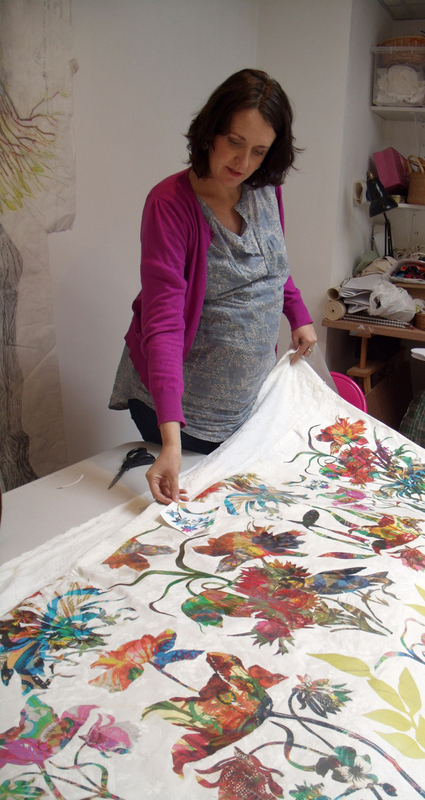 For about a month the whole of the town of Stroud in Somerset, England, is taken over by textiles to be viewed in exhibitions, talks, workshops or bought at specialist markets, generally a must-go-to see show every spring. 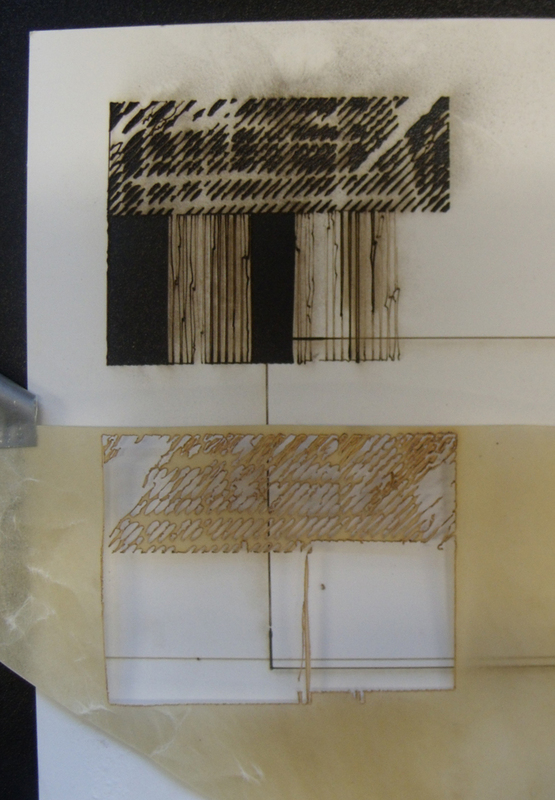 I have been invited to make a piece of work for an exhibition called Pairings, where several partnerships of makers have been put together to develop work. 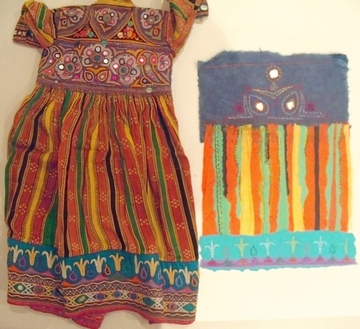 This is a result of the Stitch and Think project that was the major part of my research post at UWE. 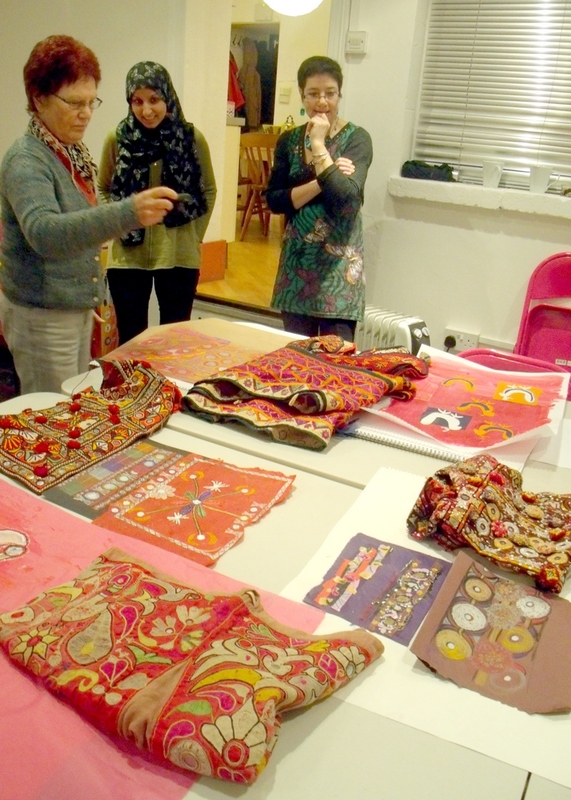 Bristol, Alice Kettle, a Senior Researcher Fellow and applied artist using machine embroidery has been conducting a similar project at MMU ( Manchester metropolitan University) and she invited several members of the research group to join in this fascinating project. 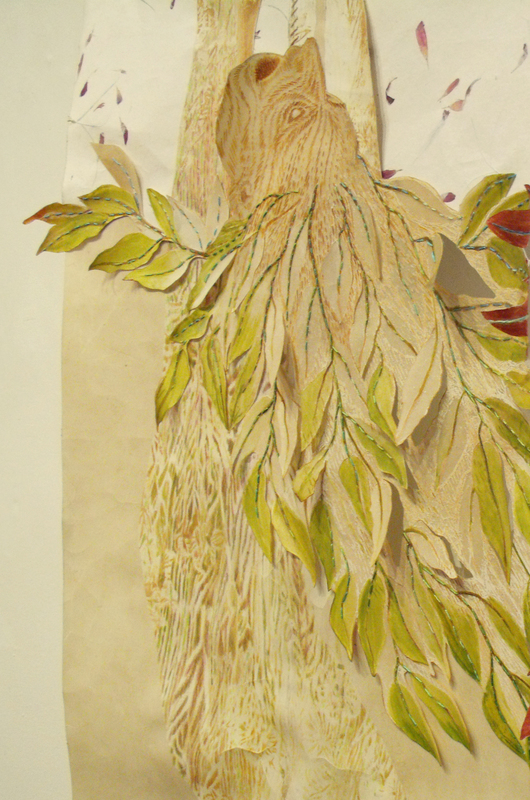 Over the past several months I have been preparing work to make a combined textile based on the idea of Metamorphosis. 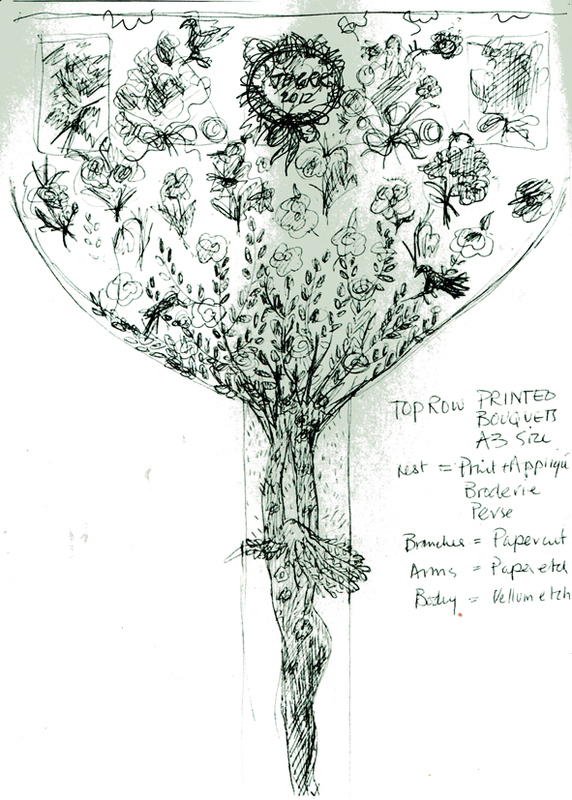 My partner, chosen by Alice, is Rachel Kelly, a textile designer specialising in Wallpaper and an associate lecturer at MMU. 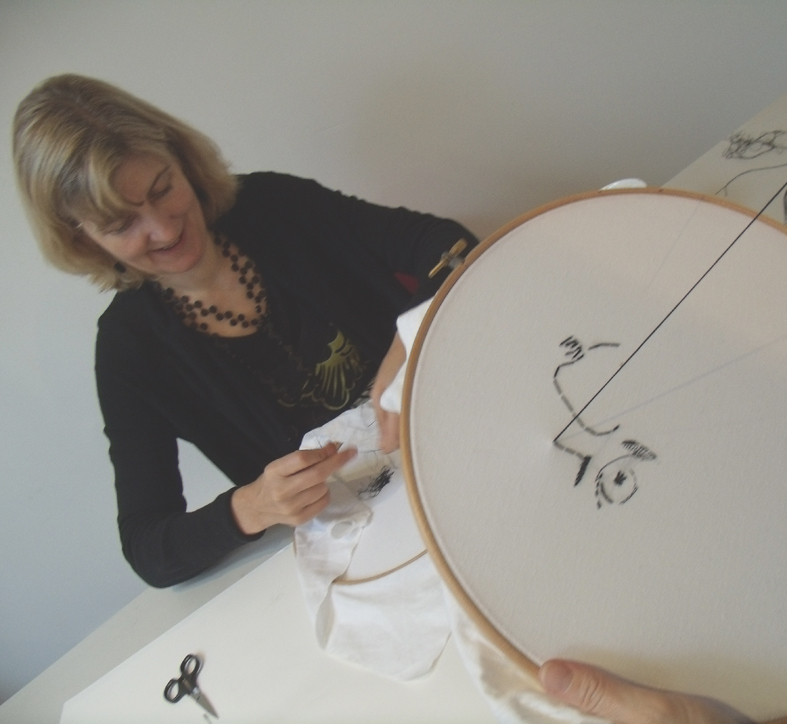 Rachel has been asked to incorporate new technology within her making processes – this should very interesting for a hand embroiderer. 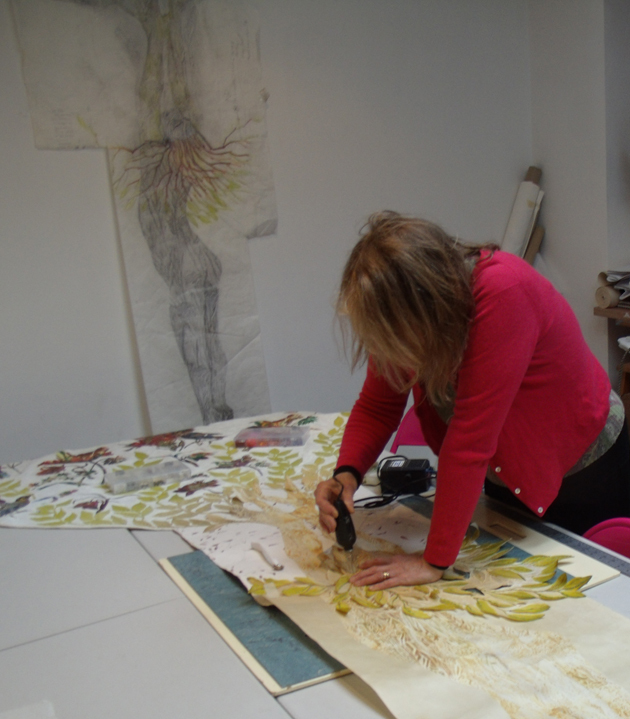 When we first discussed the work I explained about my ideas around metamorphosis; we would have to change our ways of working to develop this work and as her work incorporates lots of motifs to make your own interchangeable wallpaper designs the idea seemed a perfect fit – Rachel agreed – luckily. 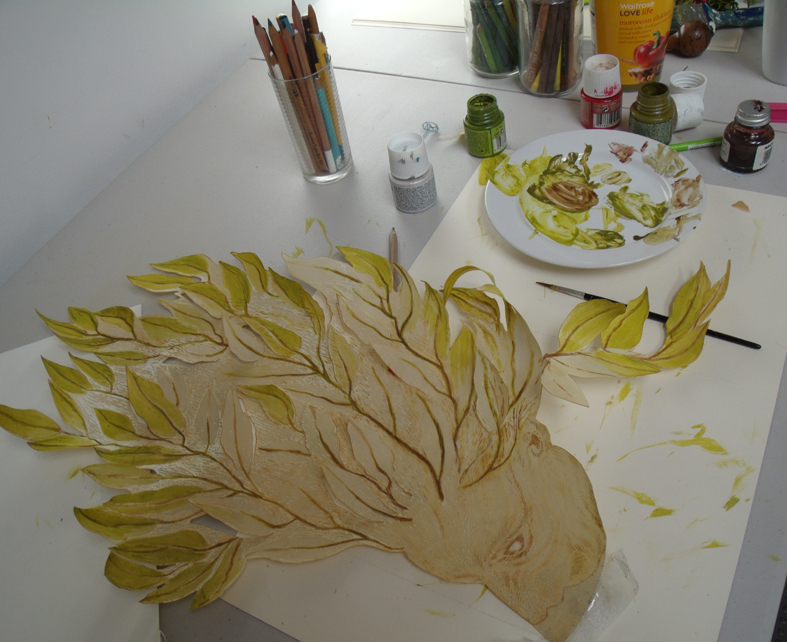 We decided also to make a joint piece of work – not easy when we live and have our own studios more than 200 miles apart. We discussed what we had in common, she read the blog and I read her website. 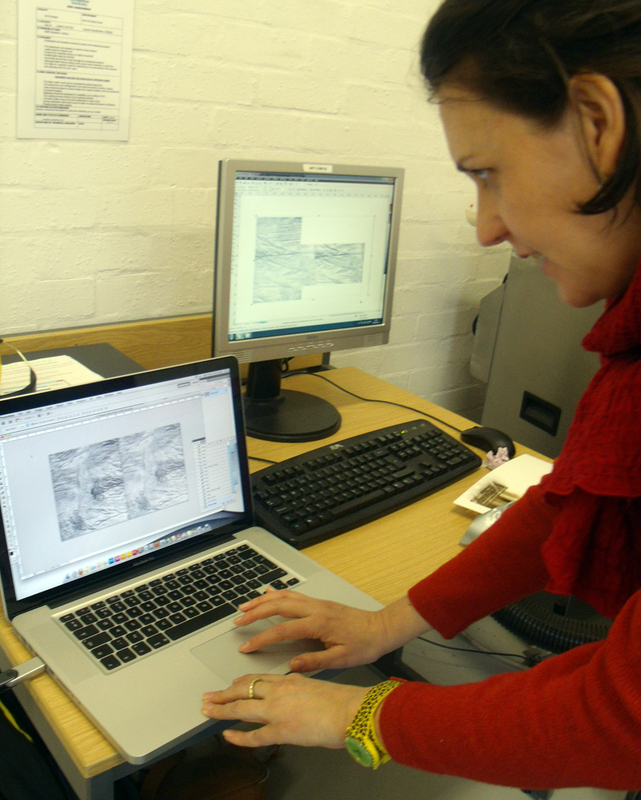 she thought we should concentrate on drawing and I recognised that she was an avid colourist – so we set to work. After some initial difficulty getting started, I suggested that we make work by the game of “consequences” one person draws something folds the paper down and the next person draws the next bit…..you can follow this interaction on our joint blog that starts this weekend. 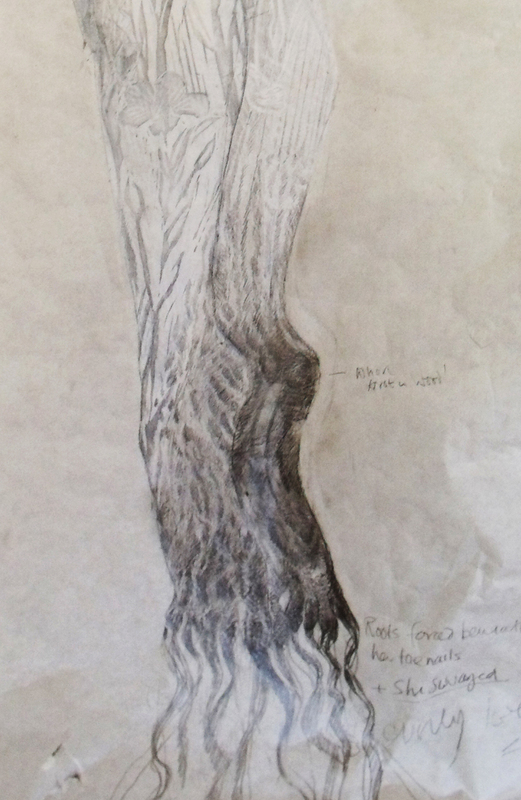 the animal side of the tree". 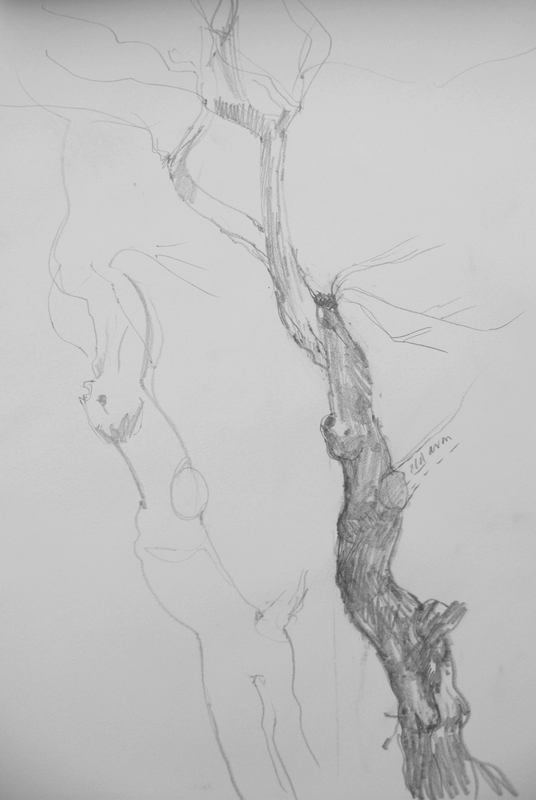 I started by drawing the tree from either side, quick pencil sketches just to make a start by recording what I could see and the camera couldn’t quite capture. The dogs got bored quite quickly and it was very damp, my paper was really limp and my drawings extremely scribbly, I sent them to Rachel via email. 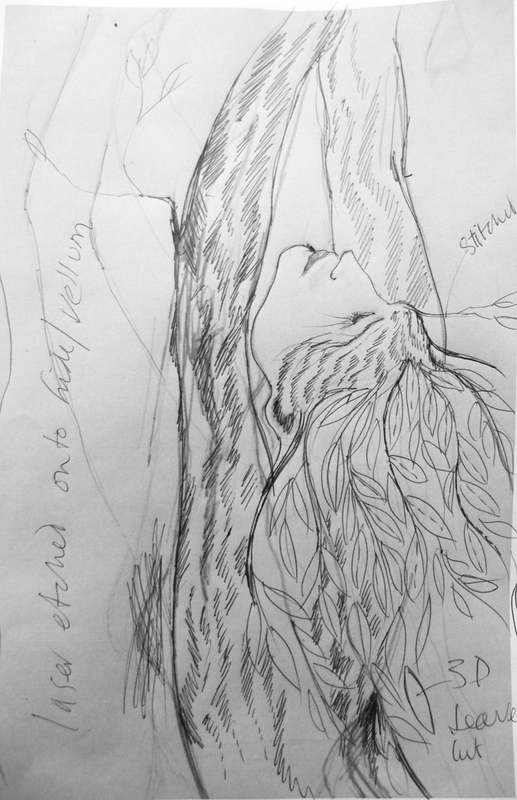 They were enough to get me started though, I next asked Sophie, my administrator at Heart Space Studios to pose for me from the tree images that I showed her. 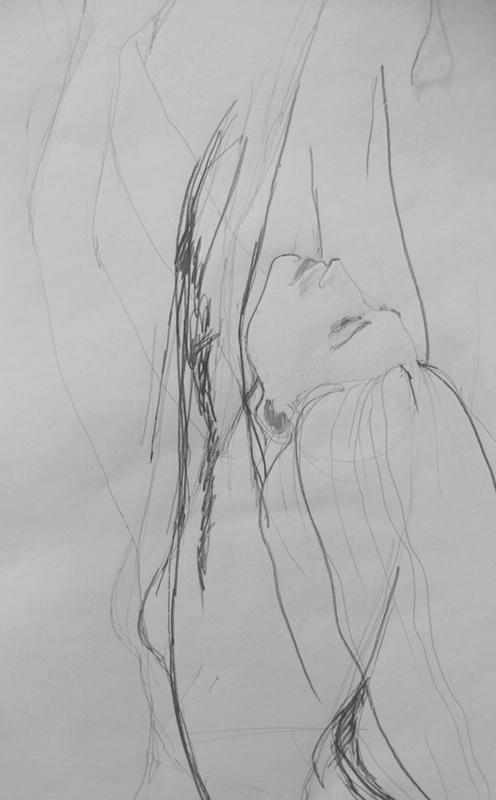 then I drew from the photographs as the pose was really difficult to hold for her. 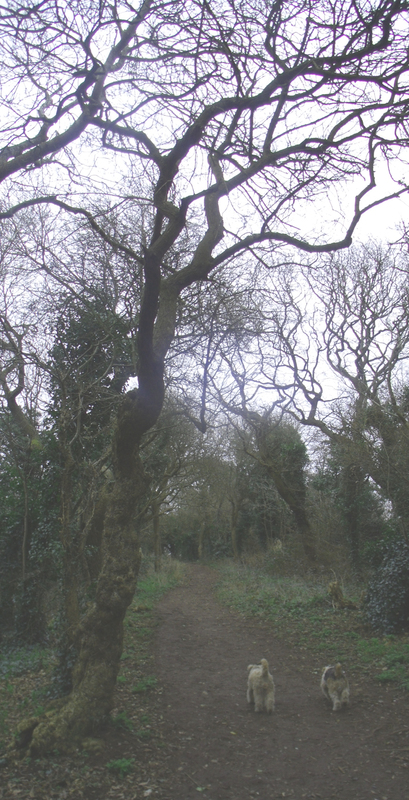 The earth gripped her ankles as she prayed. Living statuary on a tree’s foundations. I have never forgotten that passage of sheer terror when I first read the poem, and some of this somehow needs to be conveyed…so back to the drawing board. 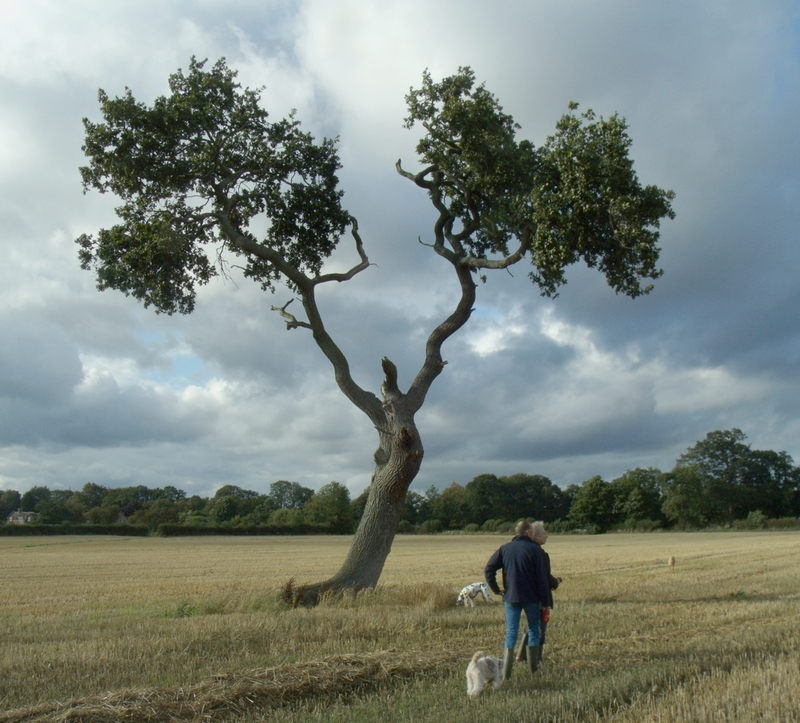 So if you wish to follow this developing project go to the joint blog that Rachel and I have set up, www.haighahdkellypairings2012.wordpress.com where we are posting our ongoing work and immediate reactions to one another.. 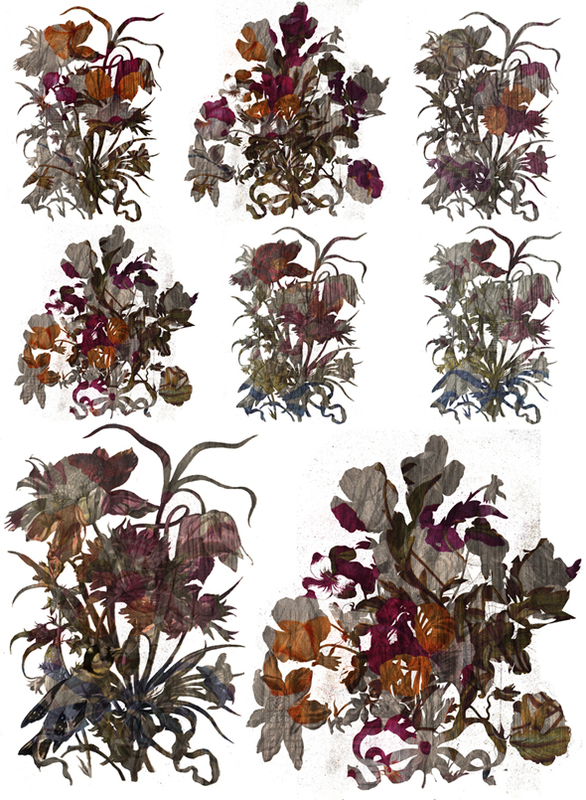 Categories: Drawing, Pairings - Live Project, The Flora Embroideries | Permalink. 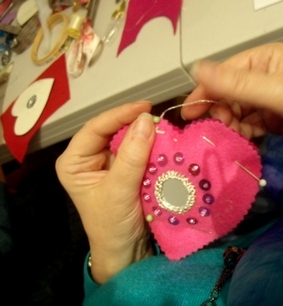 This little heart has been made for a project for the new Heart Space Stitch Club. 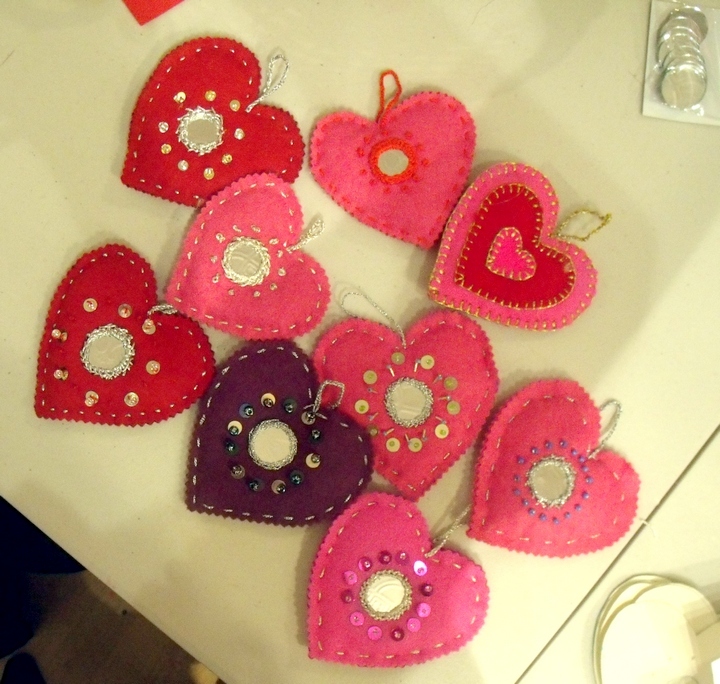 I designed several small felt hearts that could be made in an evening and taken home. 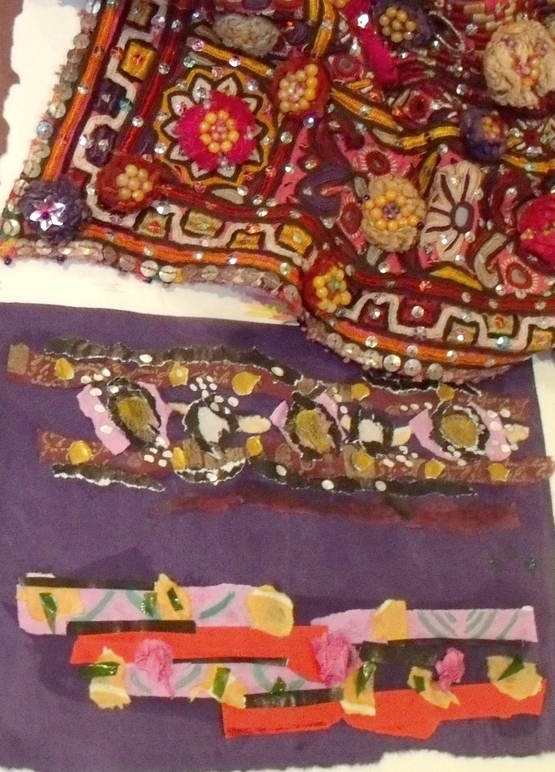 I offered everyone a choice of colours between bright pinks and rich reds with sequins and beads and silver thread embroidery, it is Christmas after all. 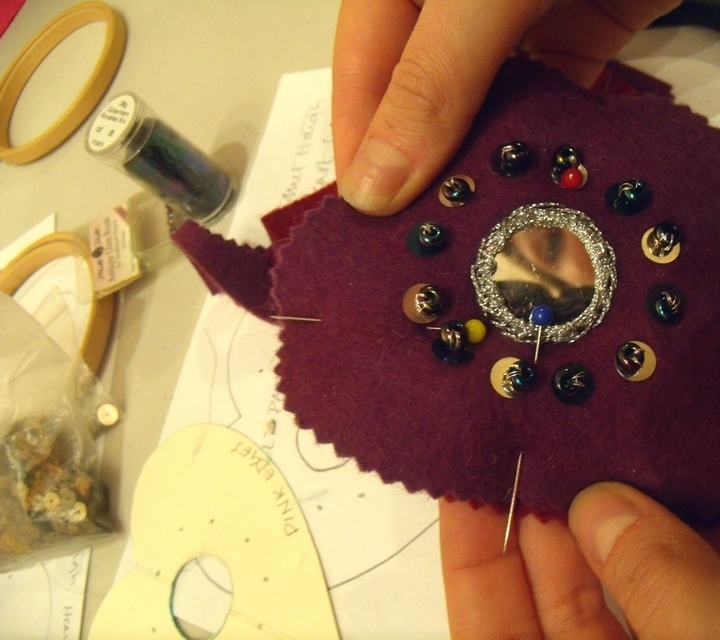 So imagine my feeling when looking carefully at the images I had taken throughout the evening I saw the maker’s eye gazing out of her tiny stitched mirror. 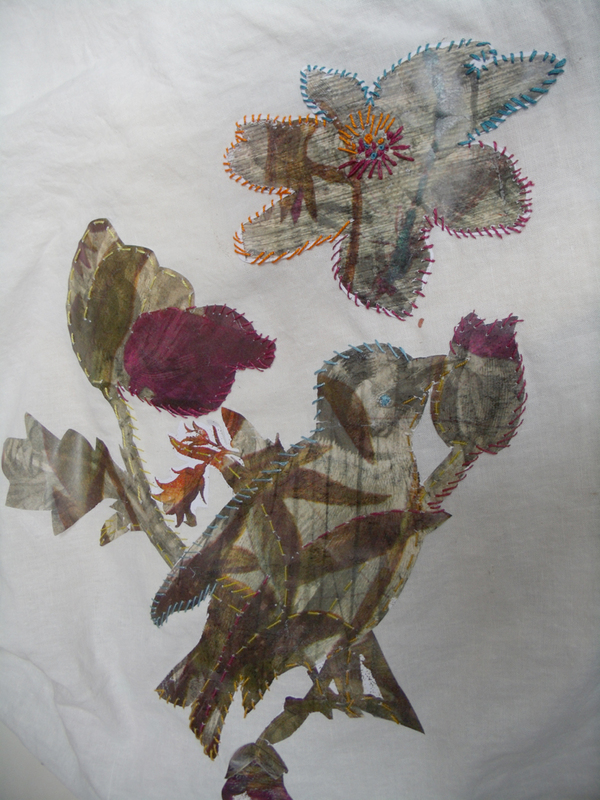 This struck me as the perfect way to introduce the collection of embroidered garments I had organised for the Drawing Club the following weekend. 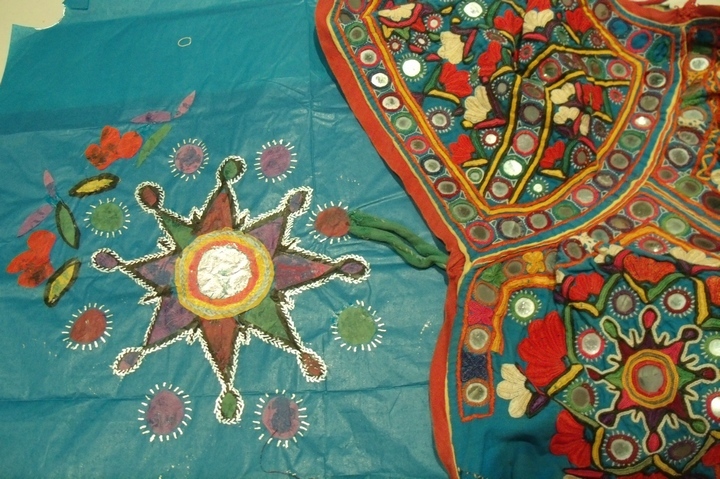 The fabrics I had chosen for the drawing class were an wonderful array of embroidery in wools and cottons and silk and silver, mirrors, buttons, shells and coins on dyed and printed grounds, all made by hand and traditionally worn for festive occassions by people of the desert communities in Pakistan and Rajahsthan and Gugarat in India. 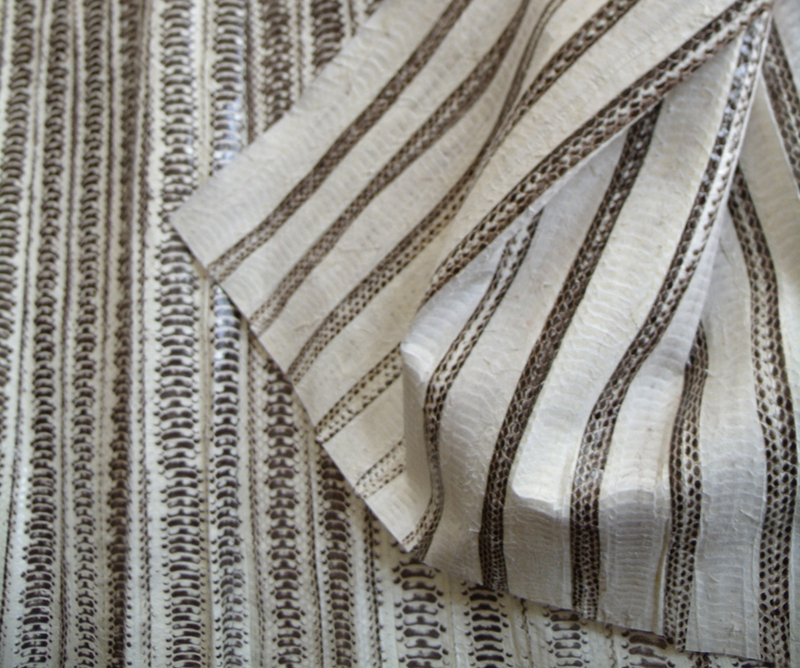 I had also brought in some books that deal with the symbolism for these fabrics, amongst them one of my favourite resource books, Amulets by Sheila Payne. 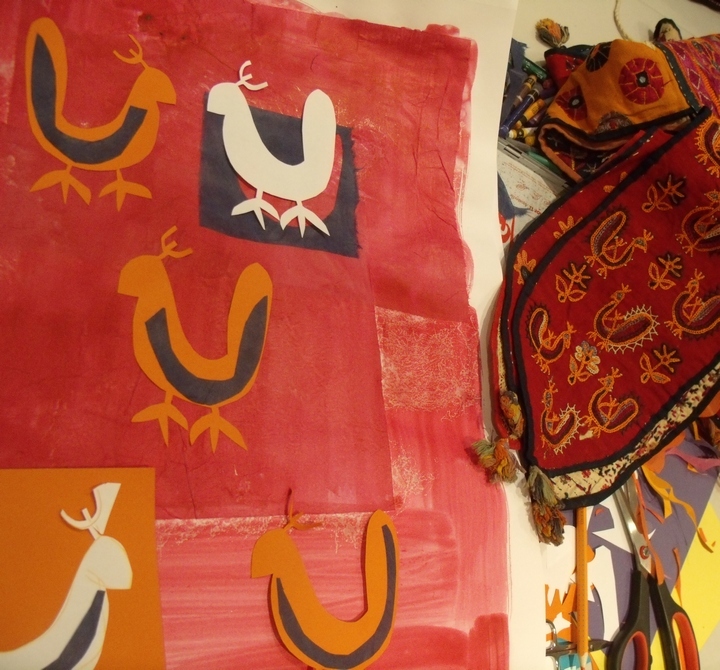 But where to start with such a myriad of pattern, texture and colour, I said to try to be faithful to the colour and the students soon set to work colouring and cutting to form backgrounds for the detailed drawings. 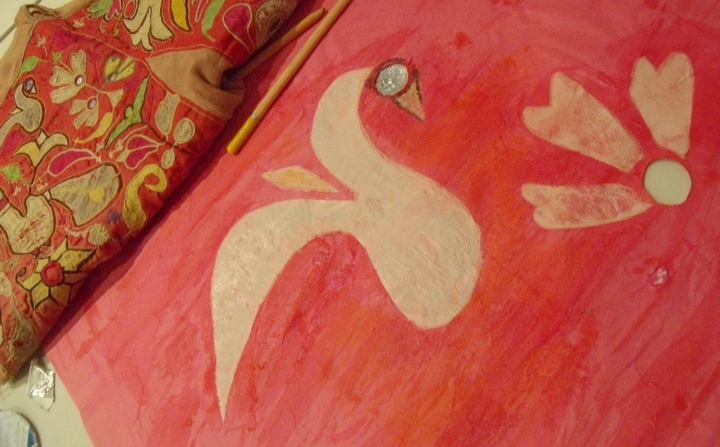 These are all worn and faded fabrics, so some of the first studies were surprisingly subtle, chalks applied to darker grounds give a broken faded effect. 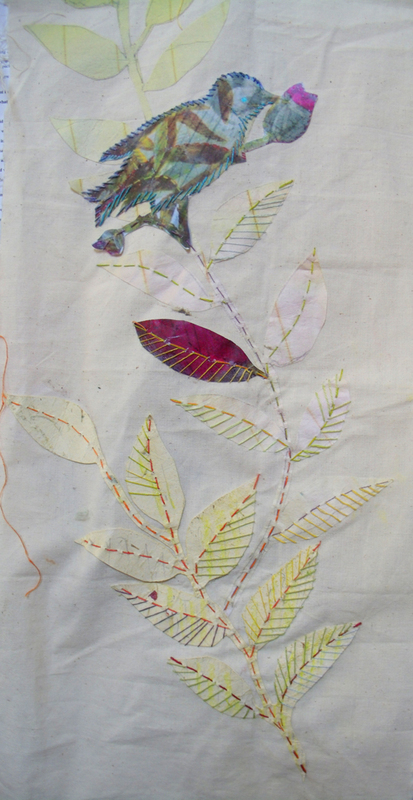 For the first exercise I asked the class to describe the embroidery in as much detail as they could, just to get them focused. 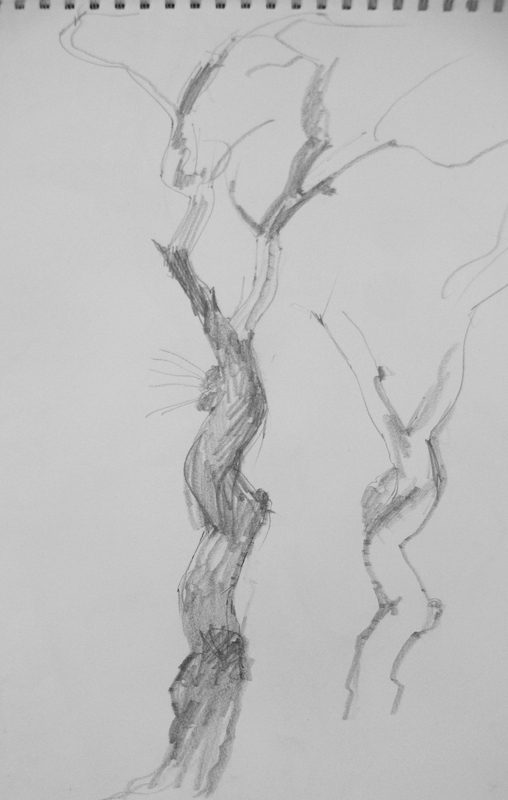 This is after all, primarily, an observational drawing class. 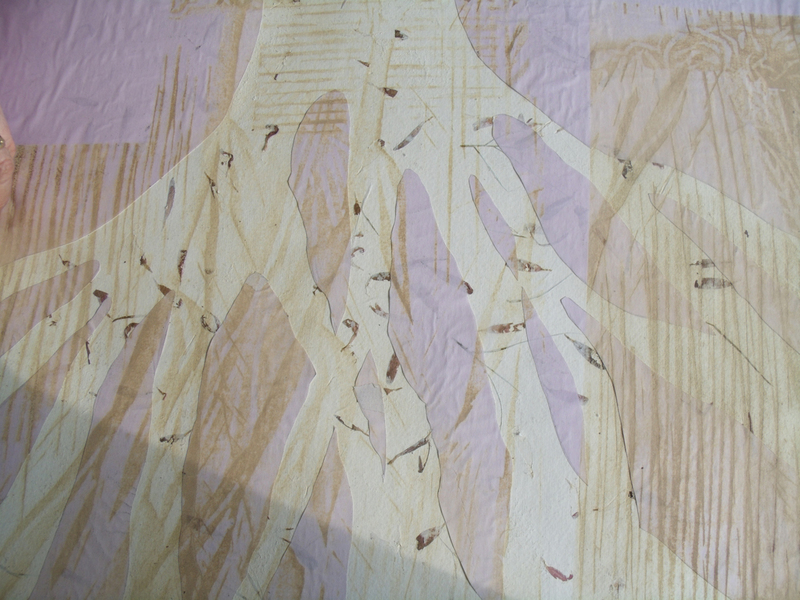 Describing the details made lively descriptive drawings and collages. I liked the inventiveness when students started to make 3D collages for describing tufts and fringes. 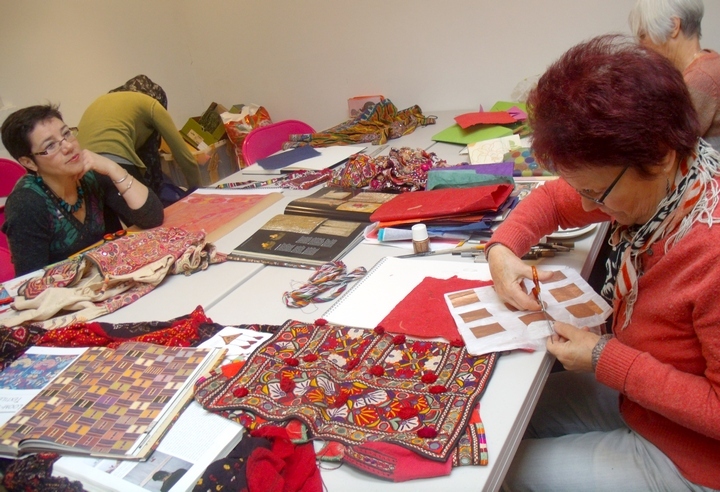 However not all the colours were difficult to attain, several people had brought in their own materials and some of the hand-made papers were really good colour matches. 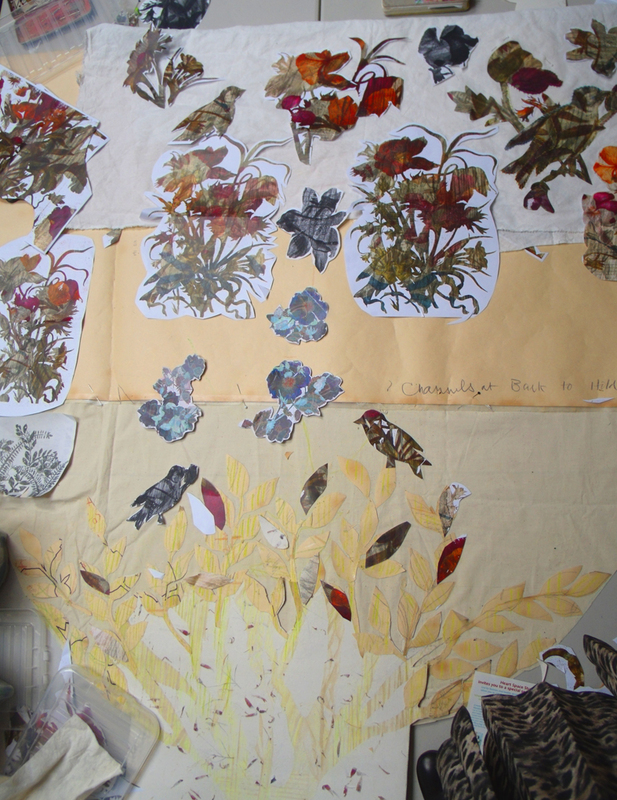 As one member of the group had requested a workshop featuring collage I had provided lots of coloured tissue papers with paints and inks in silver, plus silver- well silver coloured, metal leaf. 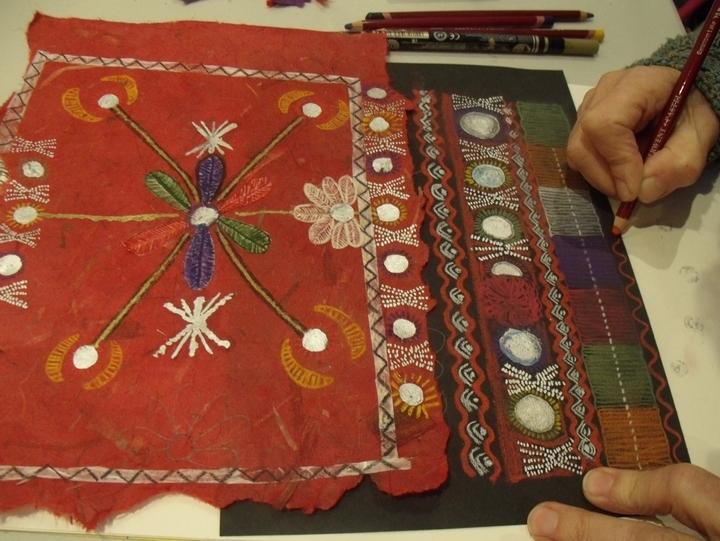 Then the drawings, themselves started to become collages, so they were being made in a similar way to the fabrics – by being separate pieces stitched together and then embroidered. 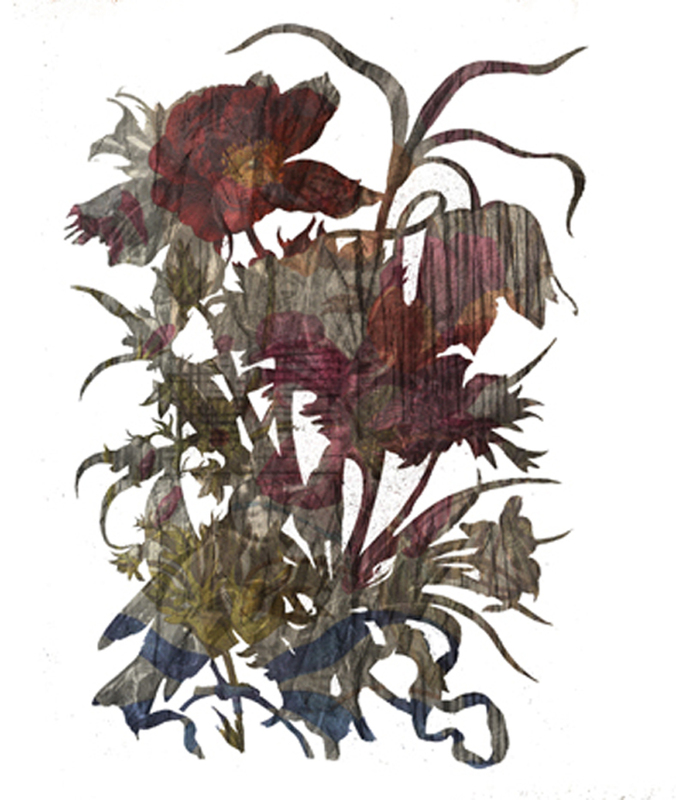 collage of 2 drawings together. 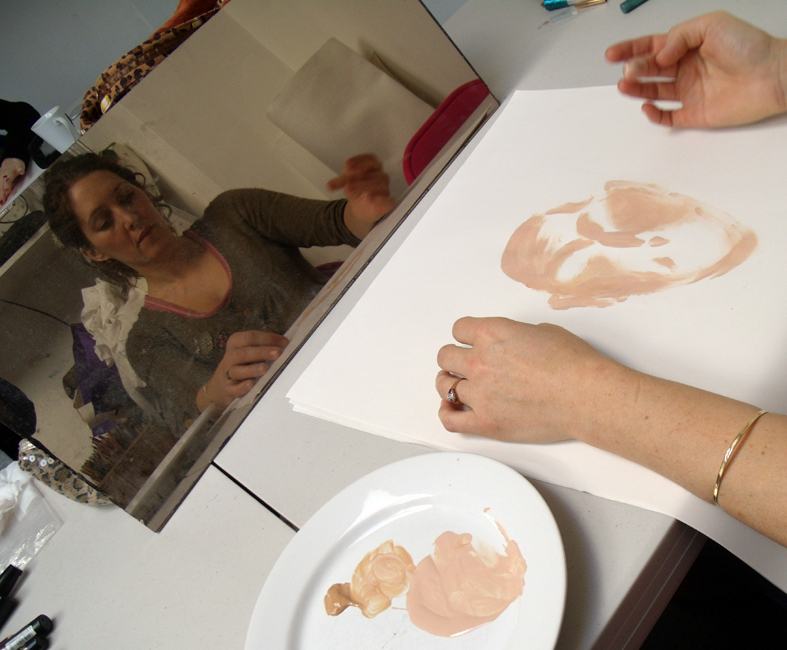 I had asked the class consider how to recreate the effects of the light bouncing from the mirrors, several different techniques were tested, silver inks, paints, foils and fibre tipped pens, that all gave different results. 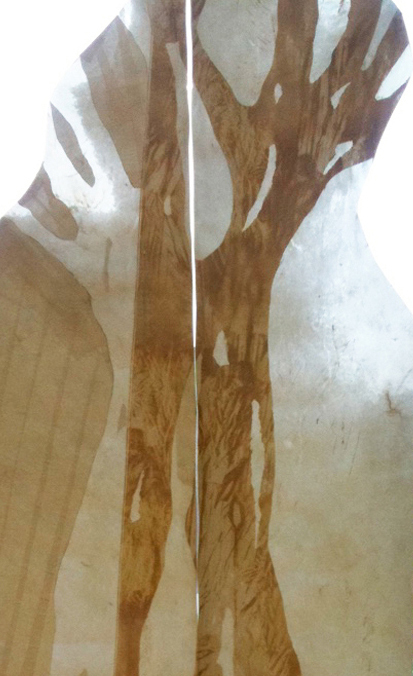 the application of silver foil was particularly successful at rendering the reflecting light. 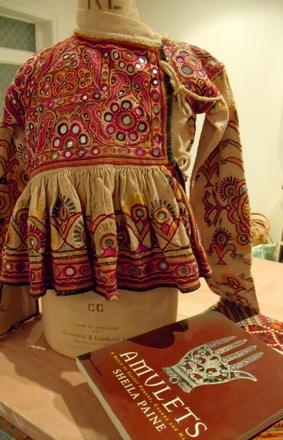 There were several fabrics that were not mirrored, but with strong embroidery patterns that were developed into bold drawings. 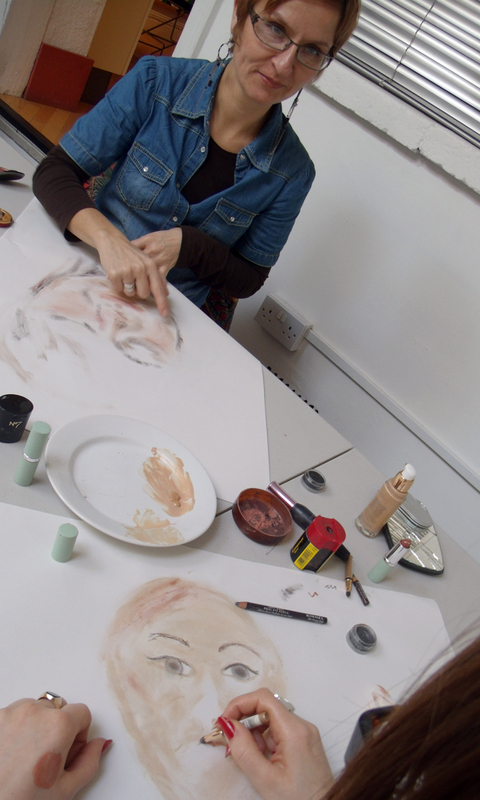 Eventually new and fresher studies started to emerge, the students were starting to express more than the look but also the spirit of the materials. 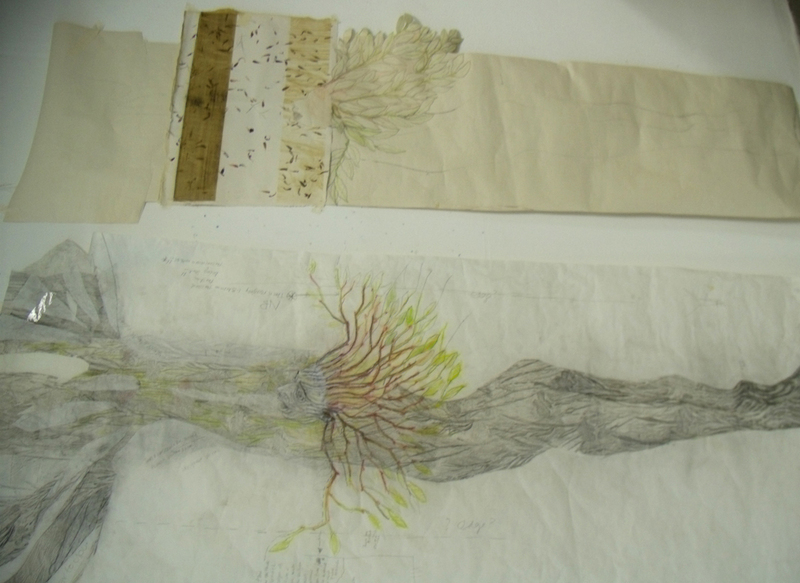 But at the end of the afternoon, we looked at all the studies alongside the actual fabrics and were amazed at the way that they belnded together, it was difficult to tell which were fabrics and which papers, not the intention of the exercise but interesting, considering the free way in which the drawings had been assembled. 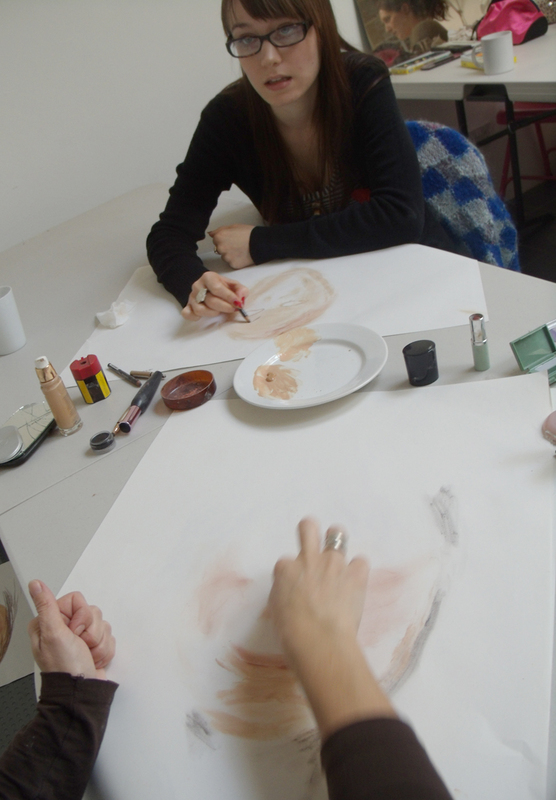 assessing and recording the results at the end of the collage and drawing session. 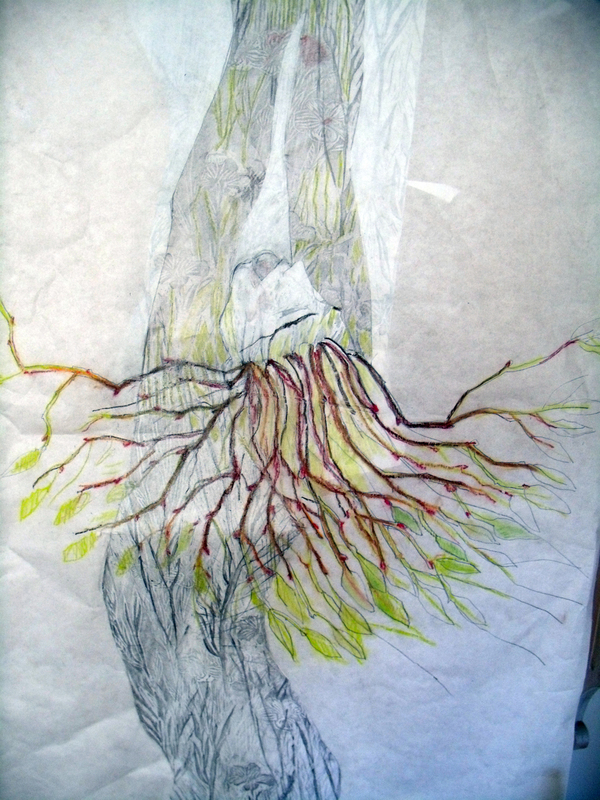 Categories: Drawing, Heart Space Studios, Stitching | Permalink. 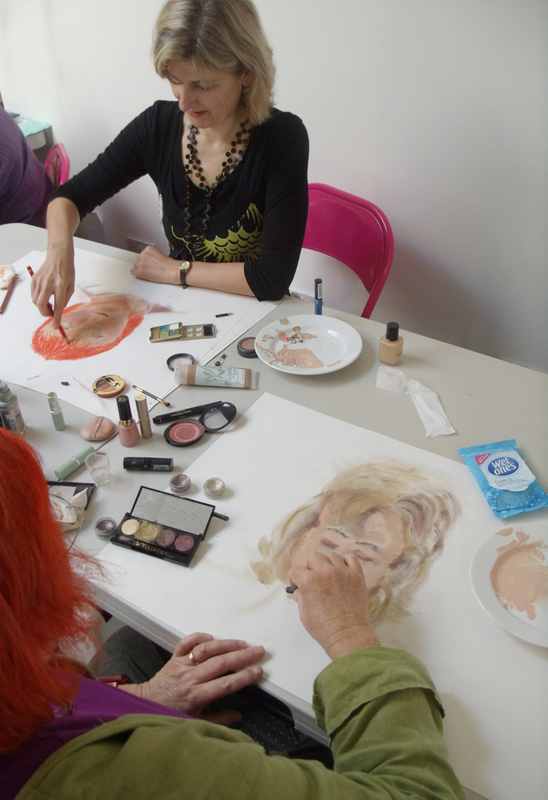 The Sunday Drawing Club that I conduct at Heart Space Studios, continues to surprise and fascinate me..this week 2 old and trusted classes in totally different ways of drawing portraits – with difference. 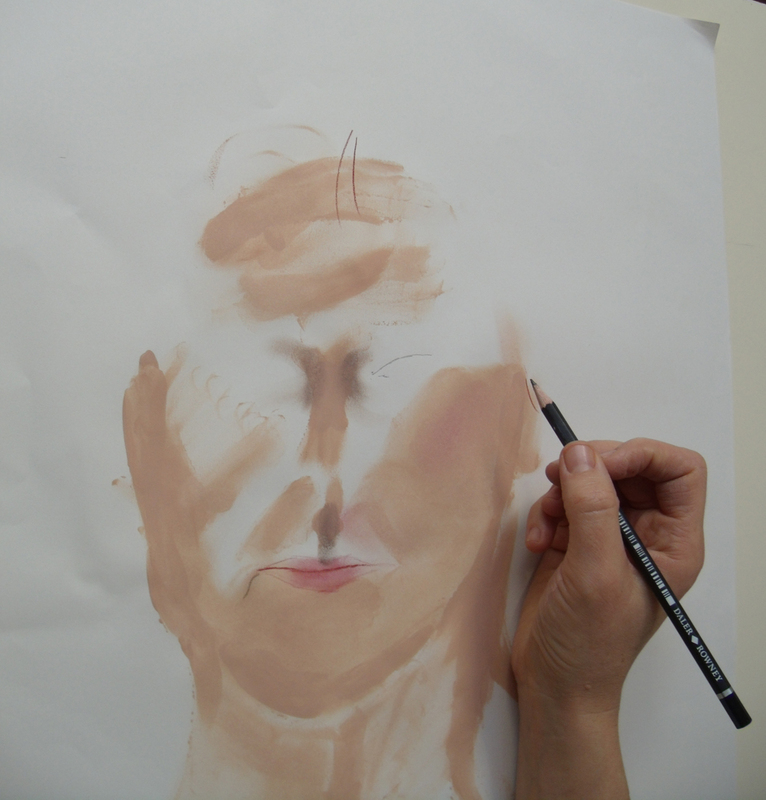 In the morning we began by using make -up to draw with, so no long sampling sessions to get the skin colours, but a real battle to manipulate the media. 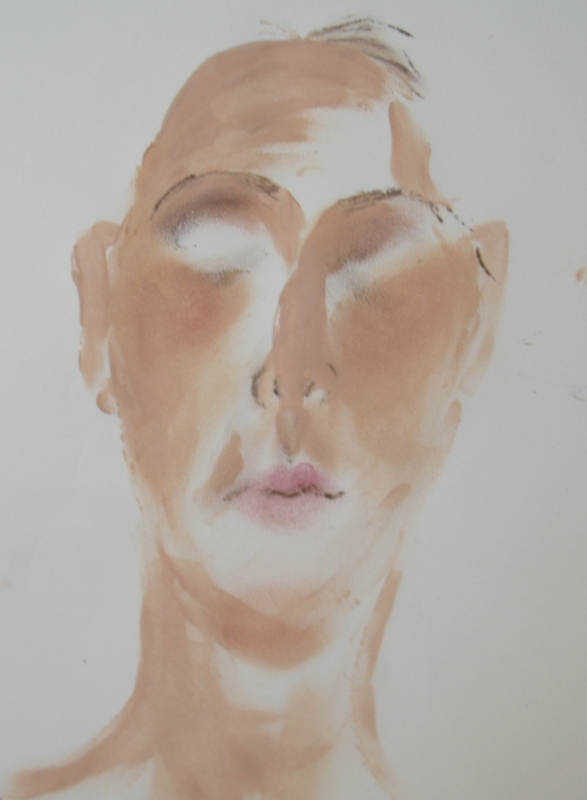 We started with self portraits….the difficulty for most women who are attuned to wearing make up is that they draw what they want to see, as if they are applying make up to the page for the same reasons they apply it to their own faces – to enhance themselves instead of using it as another drawing media. 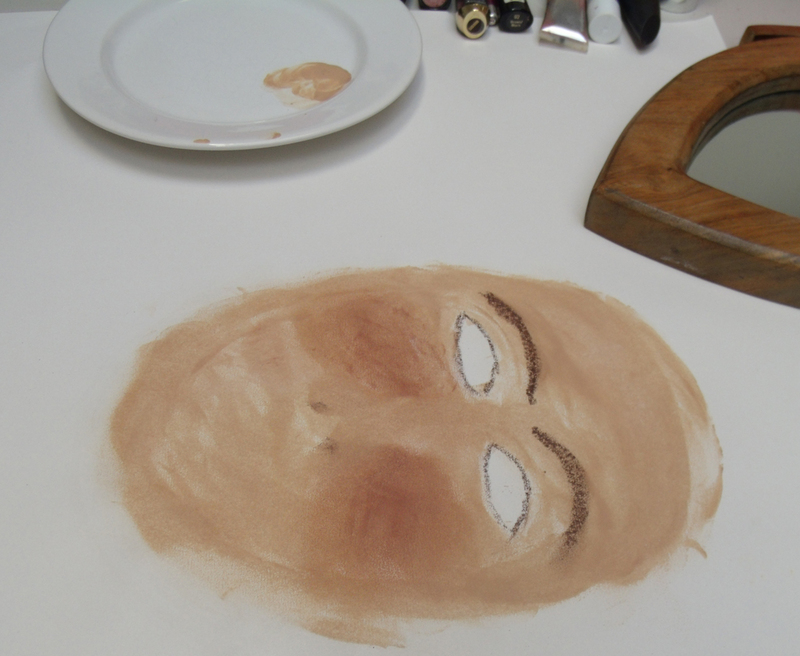 Mike did not have this problem but found the blending particularly difficult as modulating make-up on paper is surprisingly hard, some of the foundation lotions are really greasy and do not blend happily with one another . 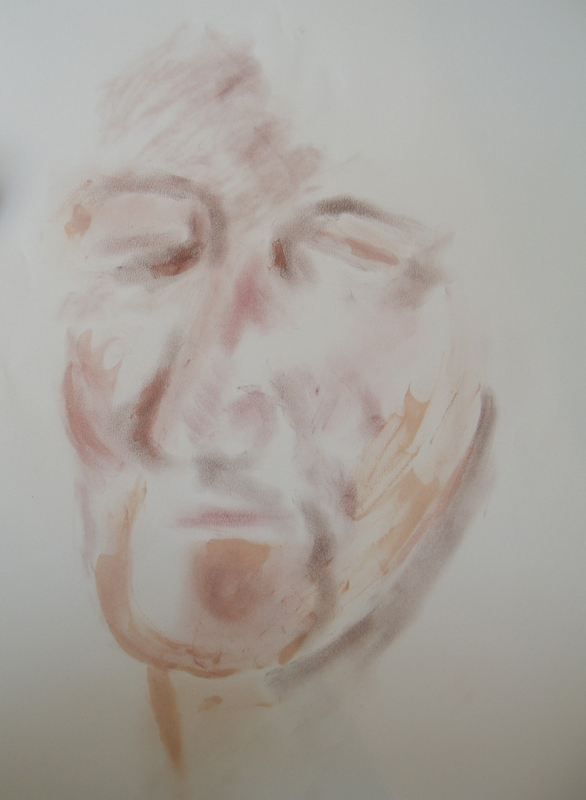 The slow build up of the subtle colours, above, was interesting to watch because eventually the tacit knowledge of applying make- up for years results in carefully modulated tonal drawings. 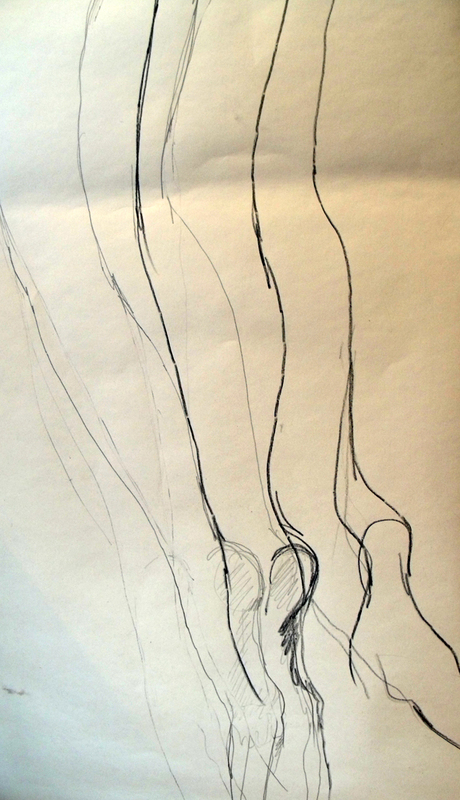 But eventually gestural drawings developed as people started to realise the potential of media. 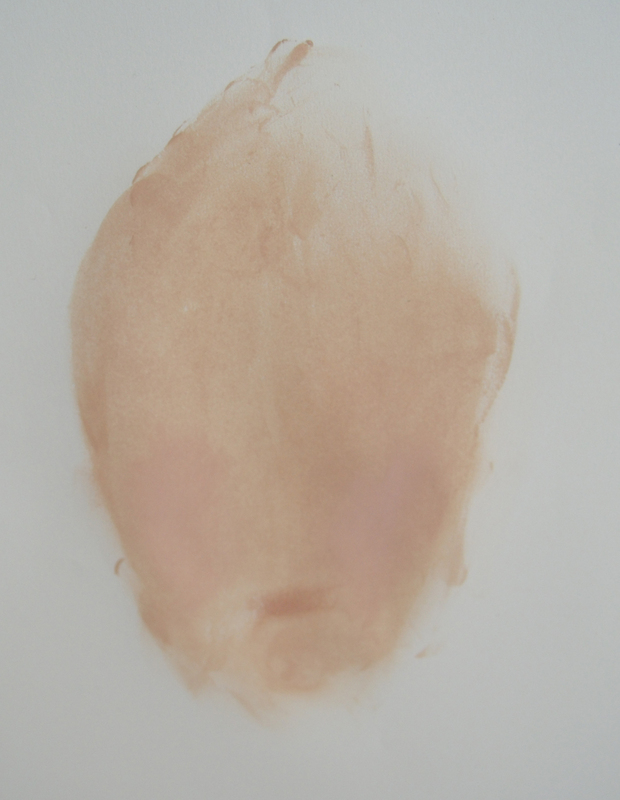 the drawing below has been made without using the techniques to apply of make- up. 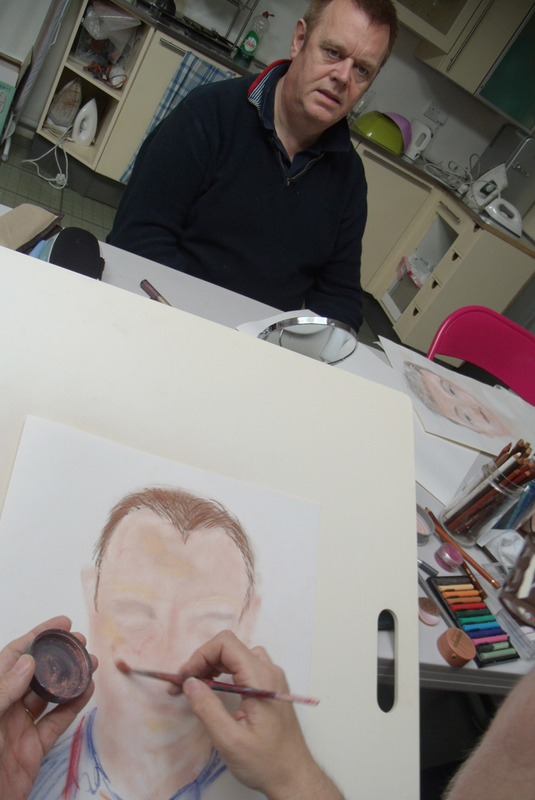 Everyone started drawing only using their fingers…. So now to draw other people…. 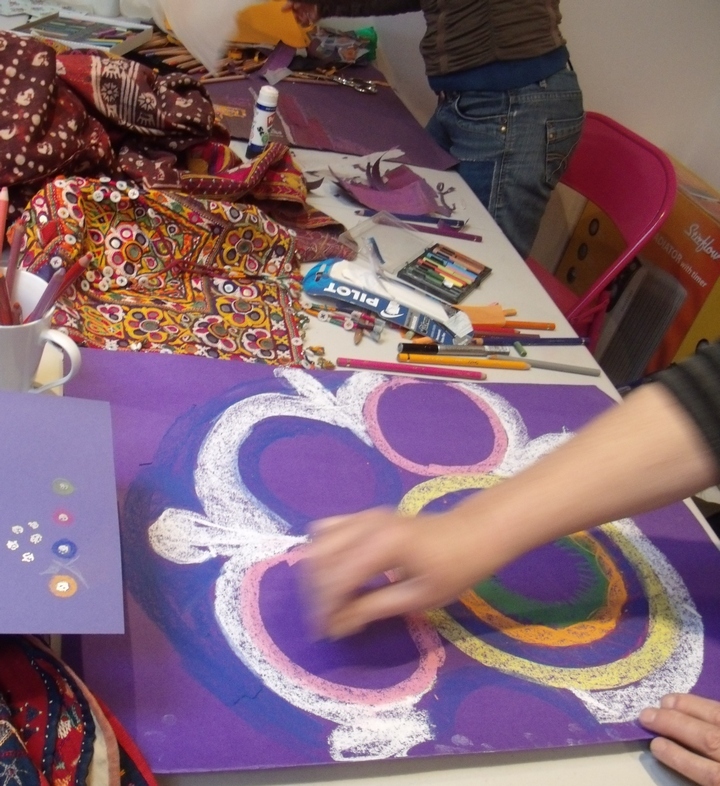 the group split into couples or threesomes…and took turns at drawing one another – this is so much harder and much patience and ingenuity is needed to be a good sitter and drawer both at the same time. 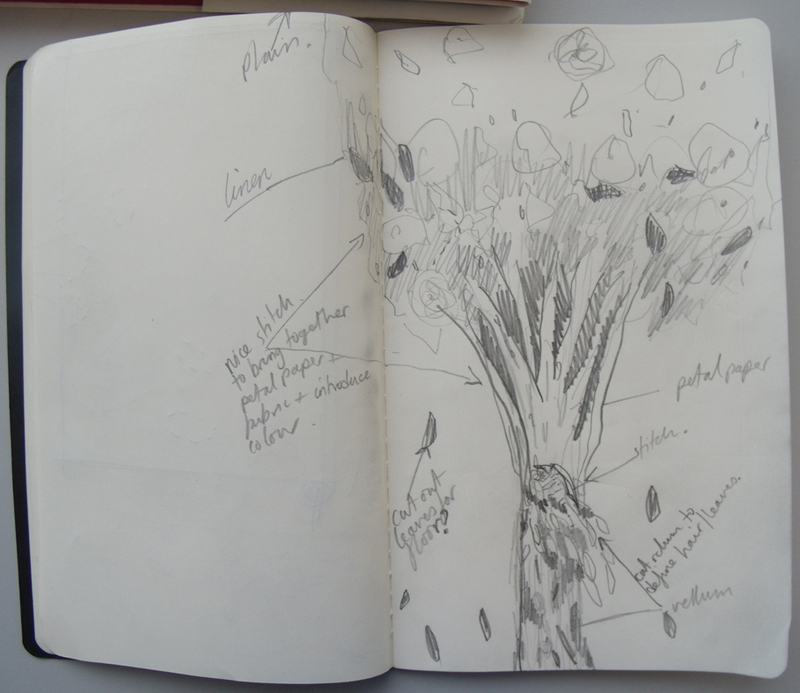 The gradual build up and refinement of the drawings was developed slowly when the students were “allowed” the use of more conventional media…I am a strict mistress when I teach drawing. The necessary degree of concentration for this way of working shows in both drawing and model above, but also look at the mouth. I had talked about how Hans Holbein completely captured the character of his sitters by drawing very precisely the line of the shut mouth…this example is well observed. But for some unfathomable reason all the people who drew bespectacled partners omitted the glasses from their drawings! 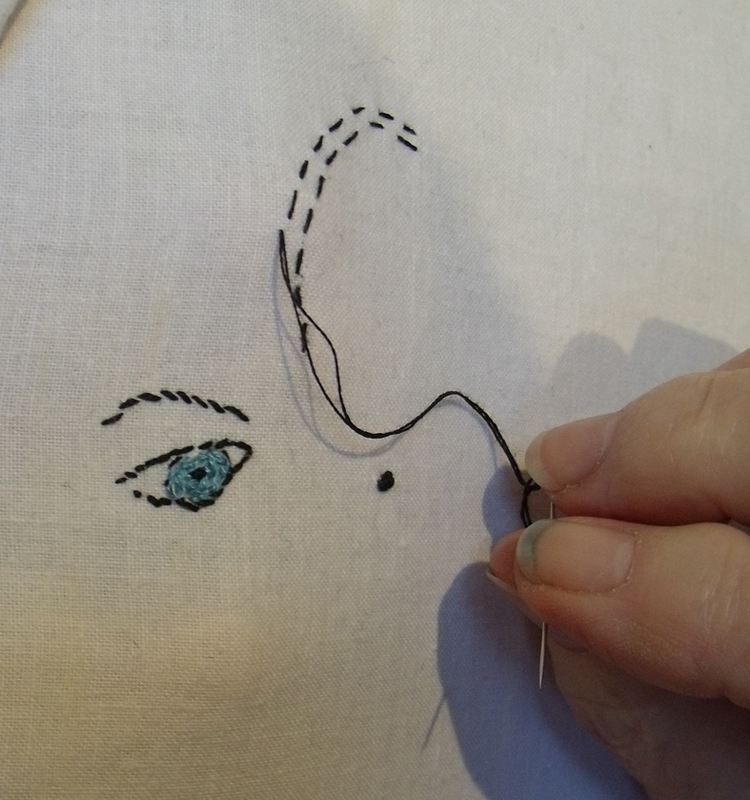 The in the afternoon session, something completely different, I started everyone stitching the eyeball but no drawing allowed only stitch – I am even stricter when I teach stitching. 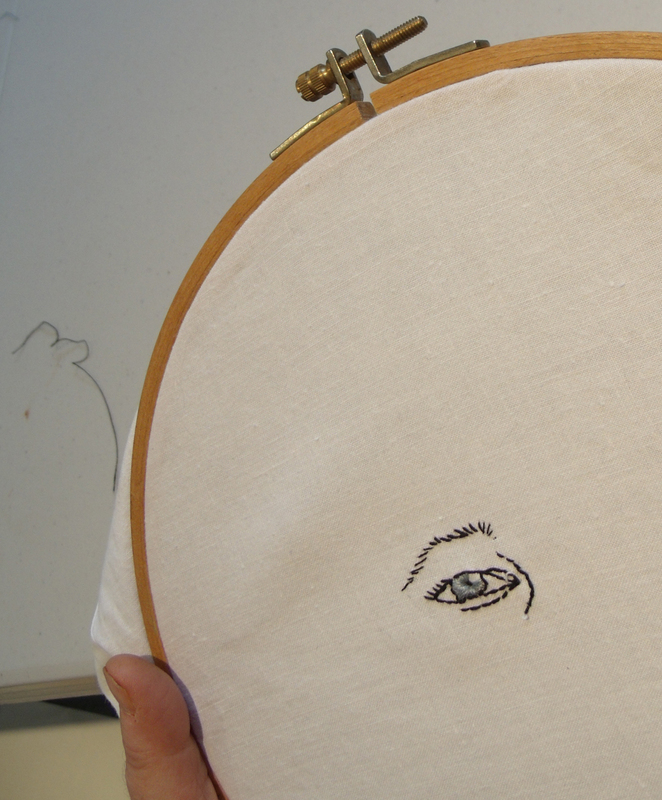 stitching a portrait starting at the eyeball. 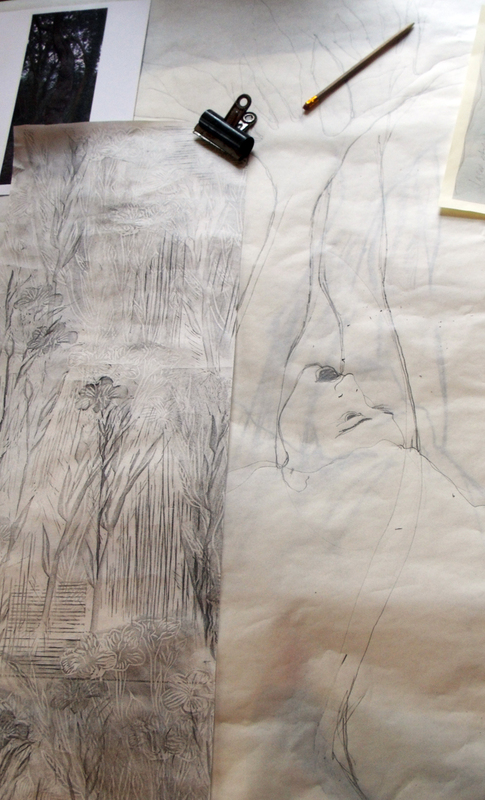 The complete change of media and type of drawing really achieved some remarkable results, slow but immensely concentrated studies resulted from the short session. 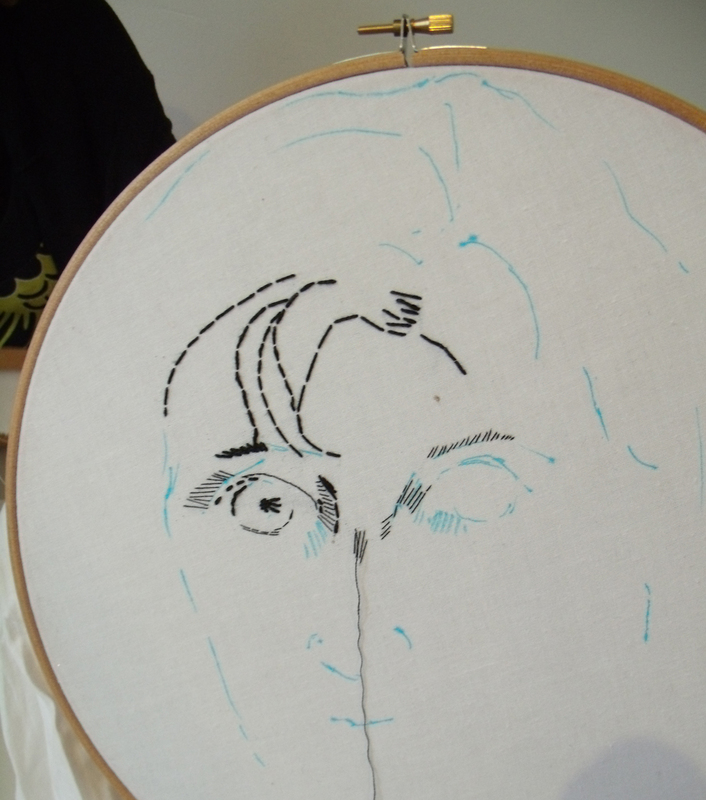 Often stitching is a release for people who imagine they cannot draw, no-one ever has high expectations for the outcome of this exercise. 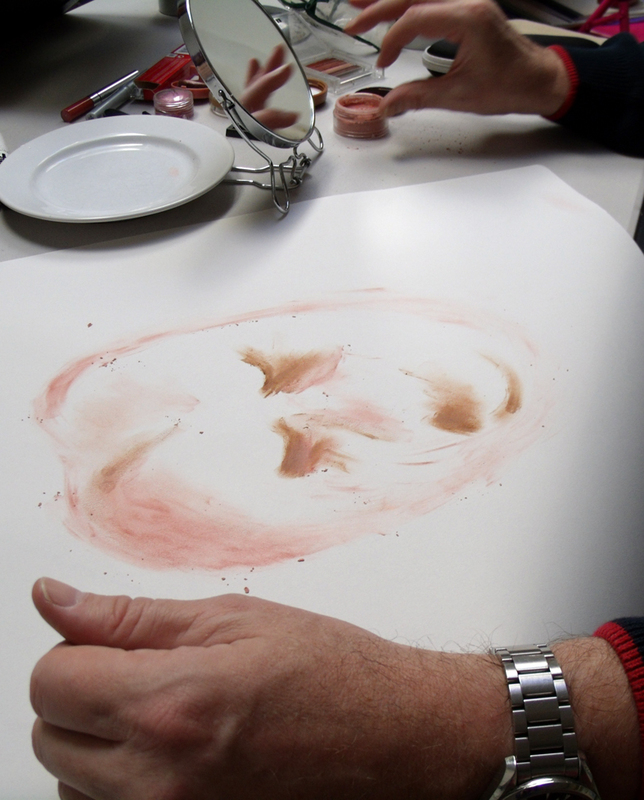 Not all the people who come to the group are stitchers, so it was fascinating to see how they tackled another unusual drawing media. 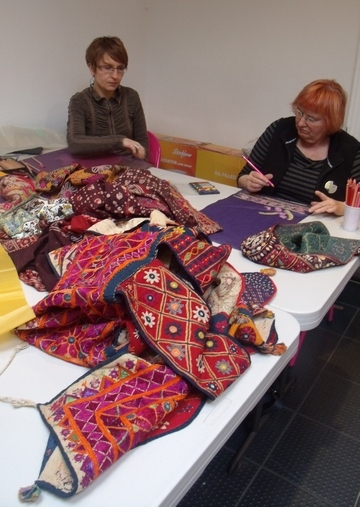 At the end of the day we had made a good start on the stitched work and several people vowed to finish them, I will post them later if they do. 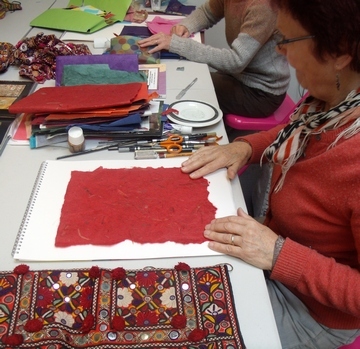 But I am interested in the variety of stitches applied to this exercise and I feel that some of the group could develop their own work using stitch – but I would think that wouldn’t I? 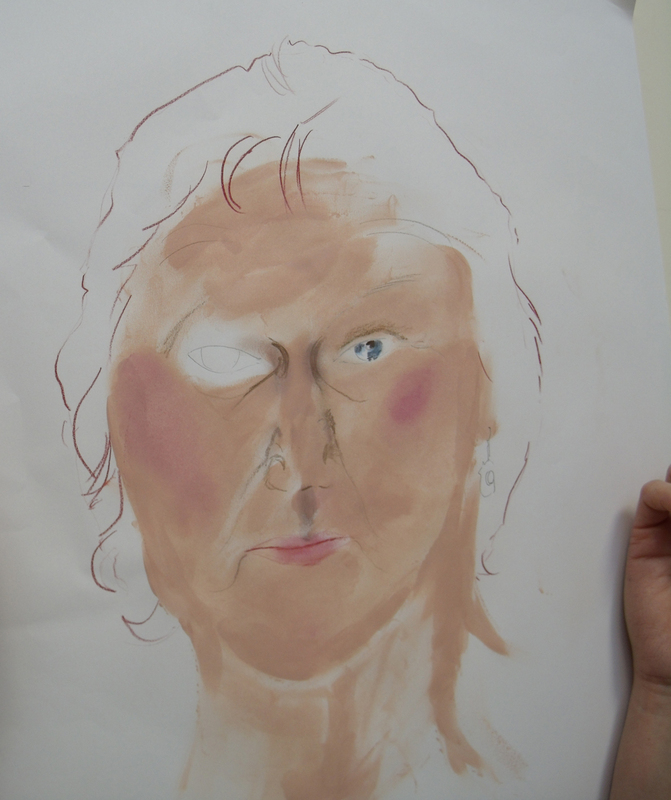 In fact I would like to have another class that involved both of the day’s exercises on one portrait…maybe later in the year. 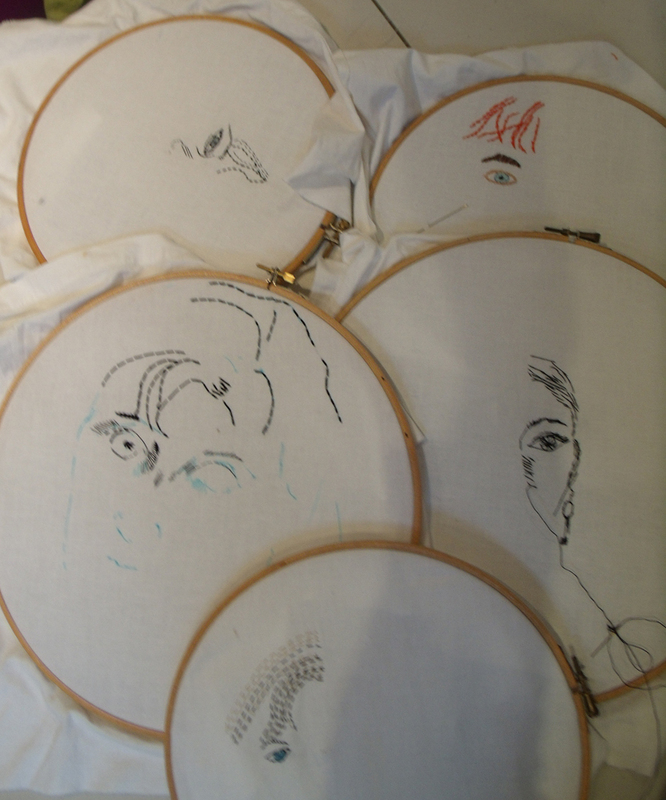 hoops of stitched portraits at the end of the afternoon. 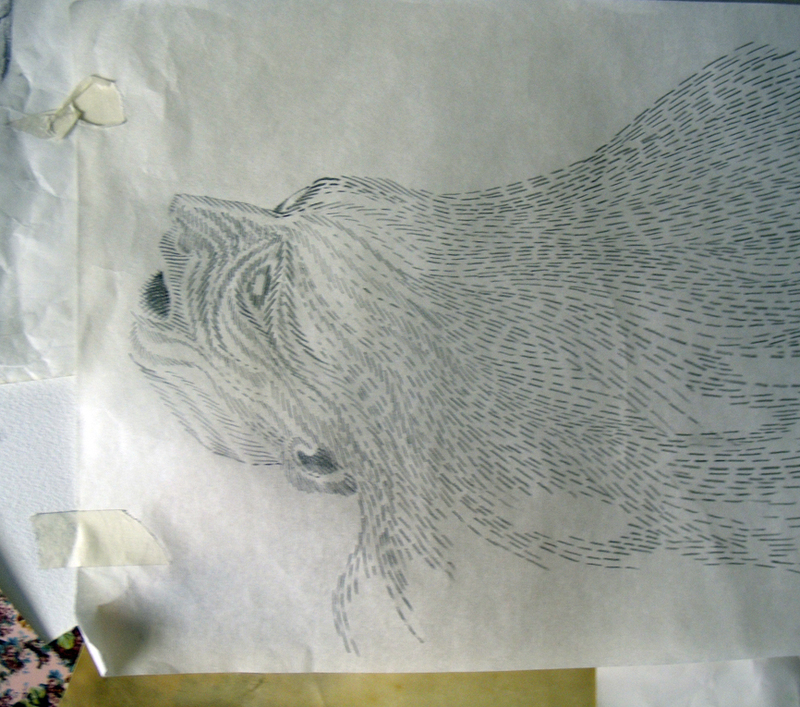 Categories: Drawing, Heart Space Studios | Permalink.